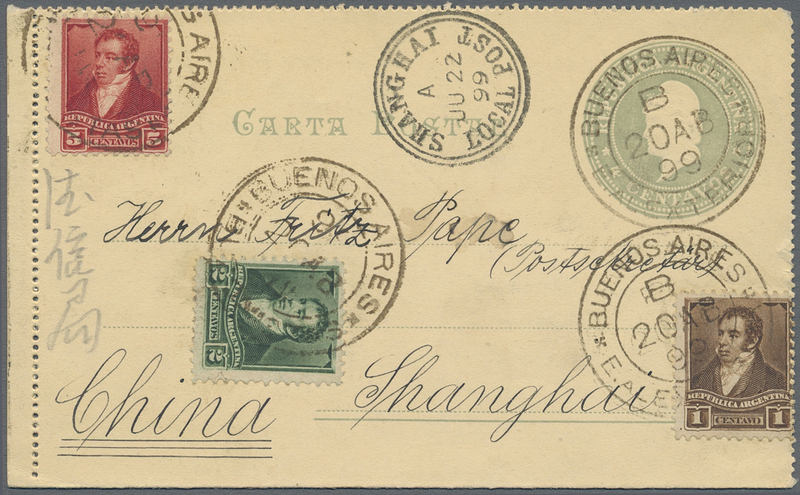 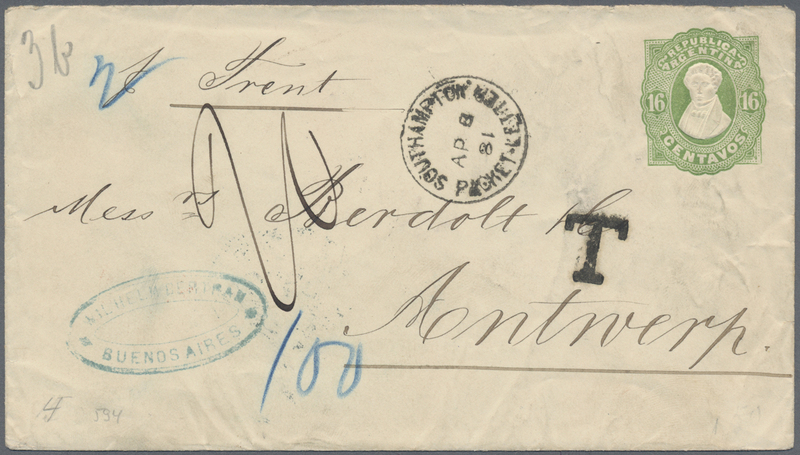 11299 Ganzsache (Complete) 1881: "SOUTHAMPTON PACKET LETTER AP 8 1881" ship mail cancellation on Argentina 16 centavos green, postal stationery envelope send by the ship "Trent" via Great Britain to Antwerpen, Belgium with 1 francs manuscript postage due (double rate). 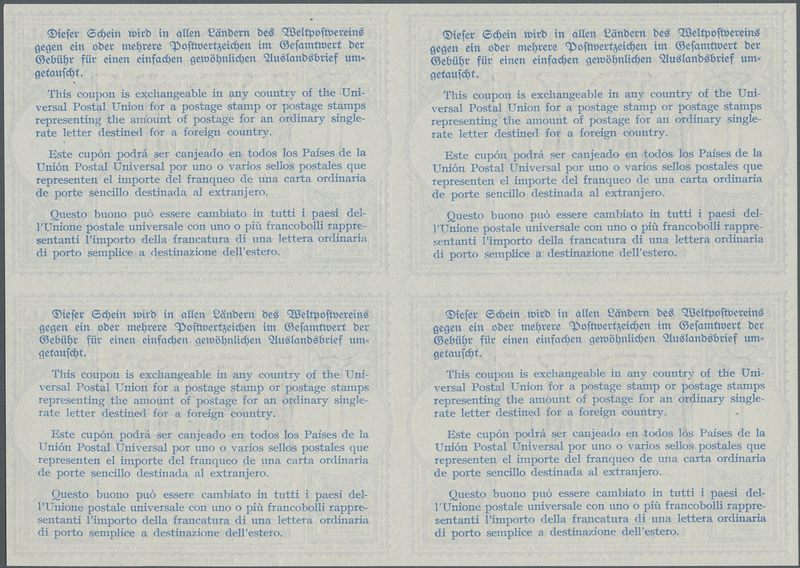 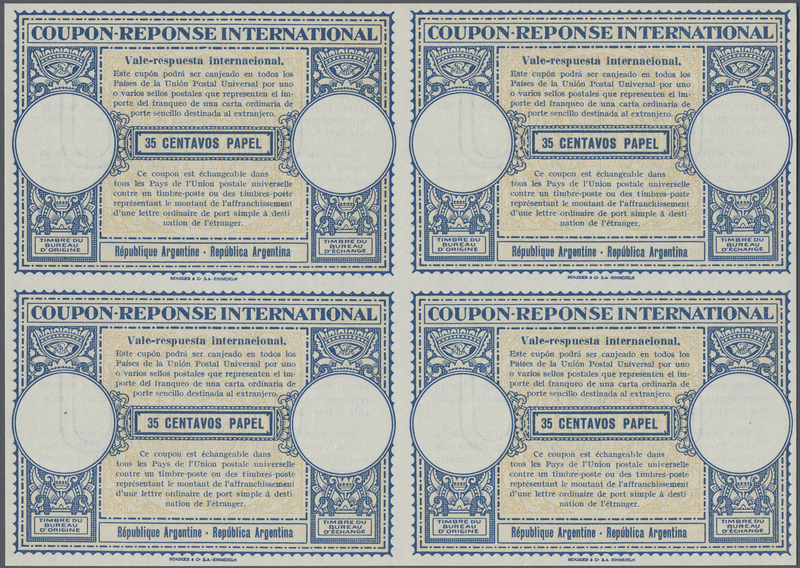 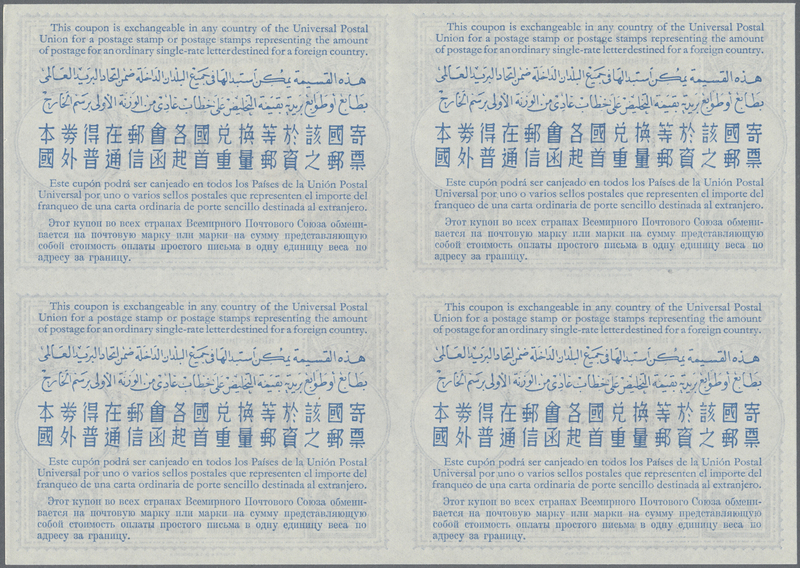 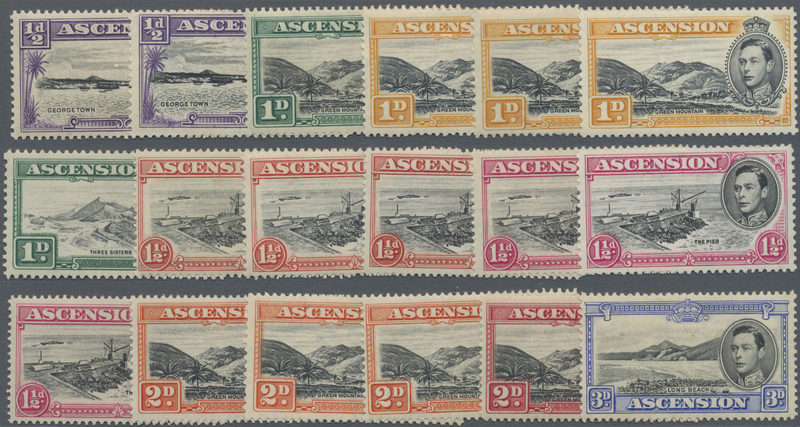 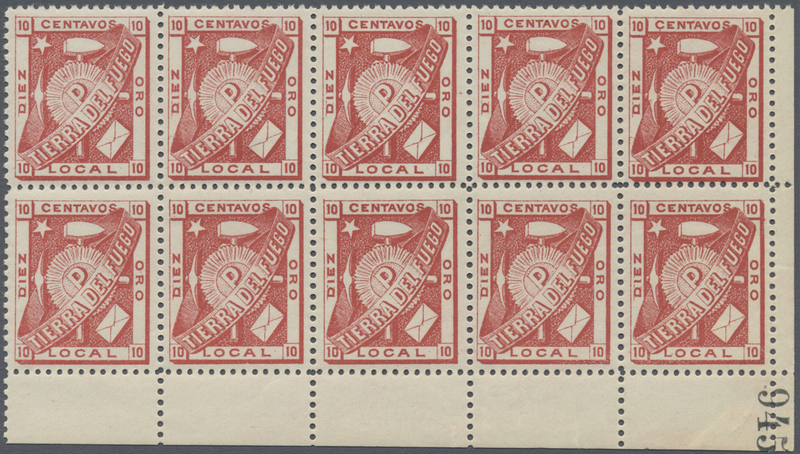 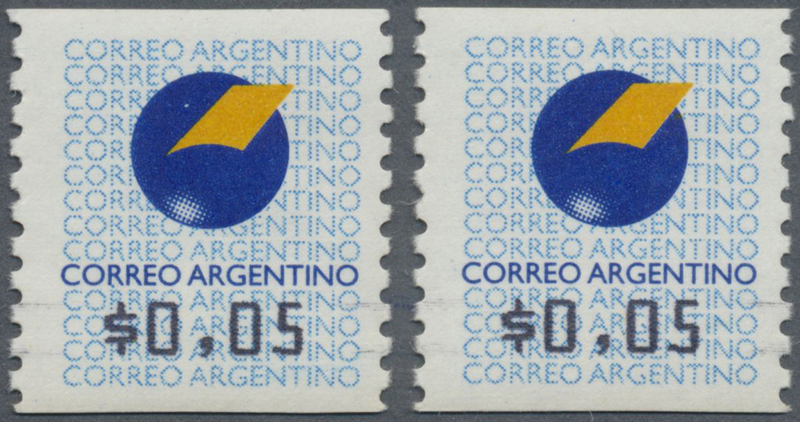 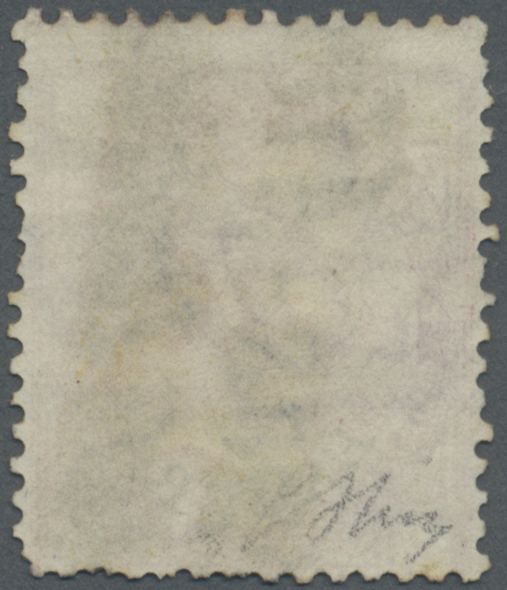 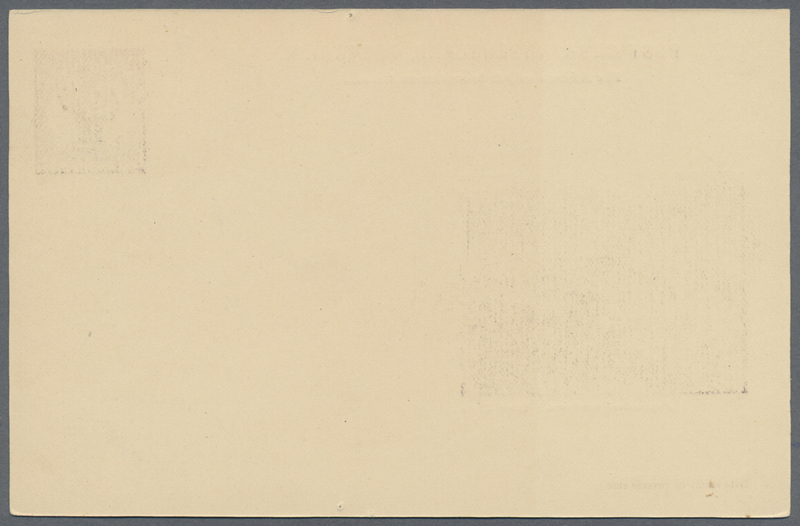 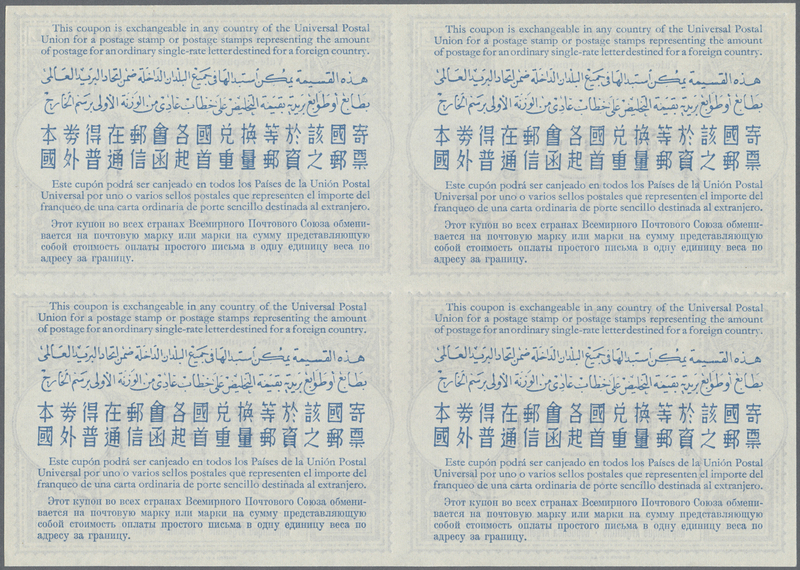 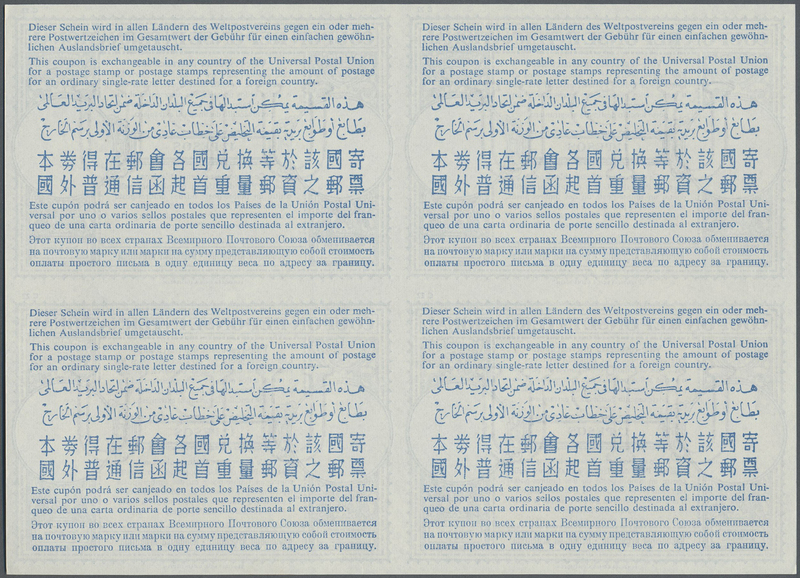 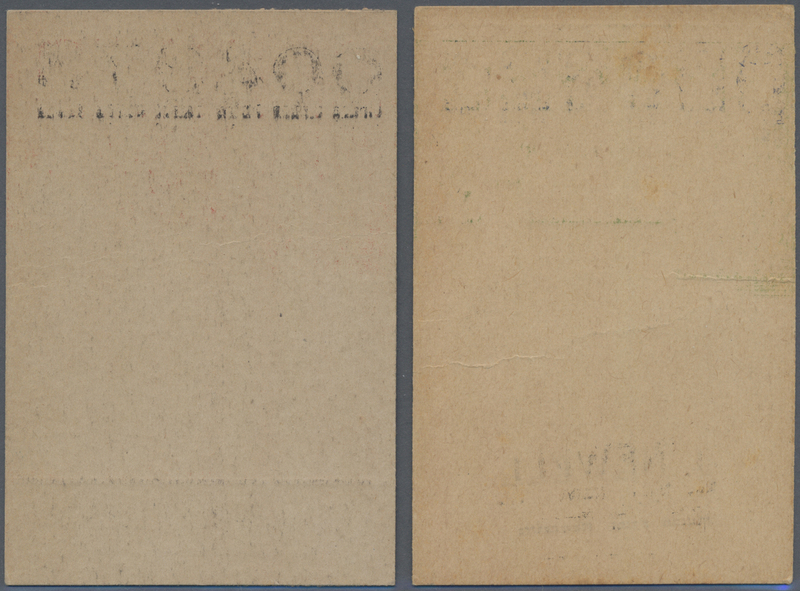 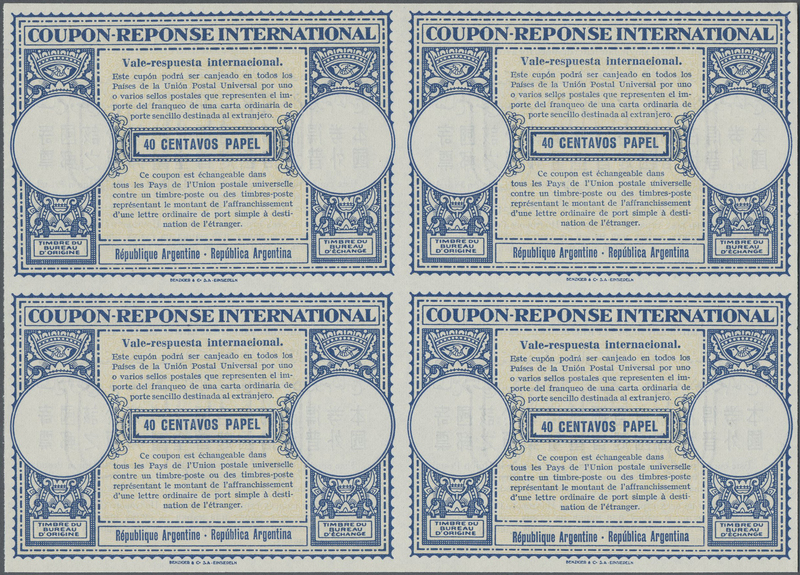 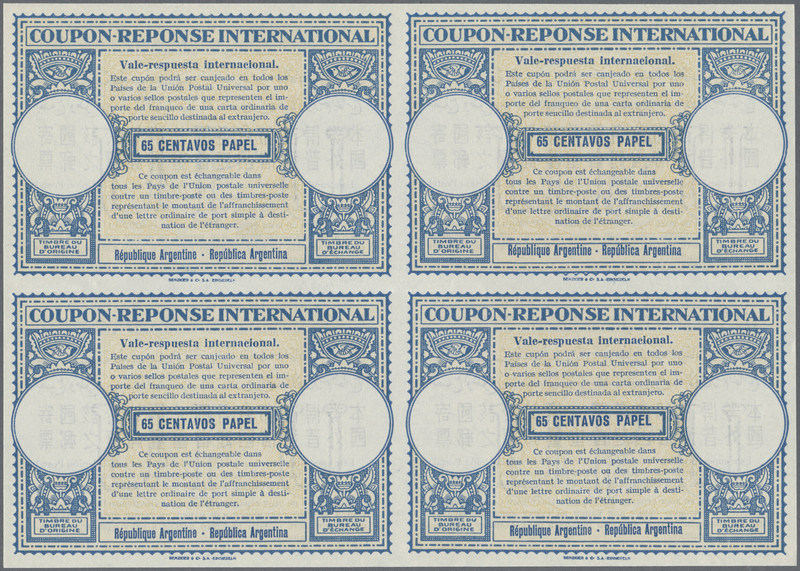 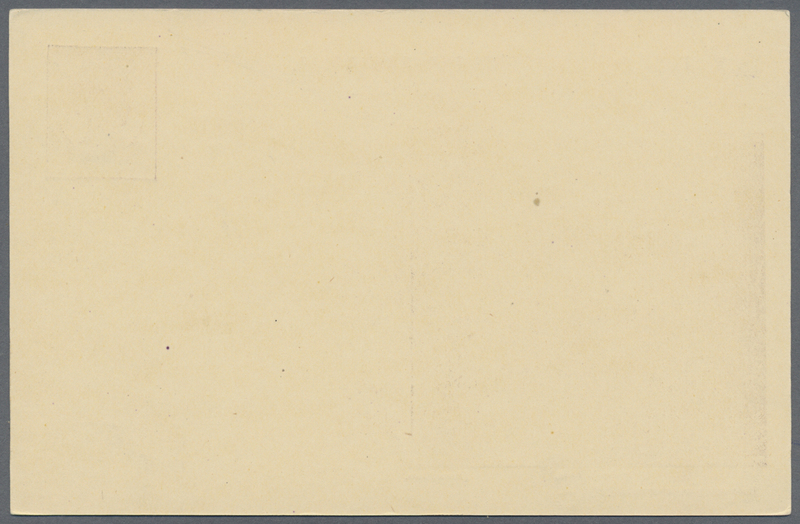 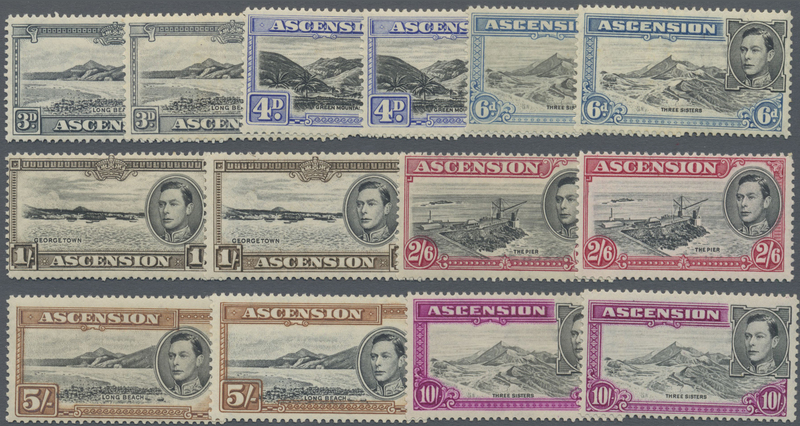 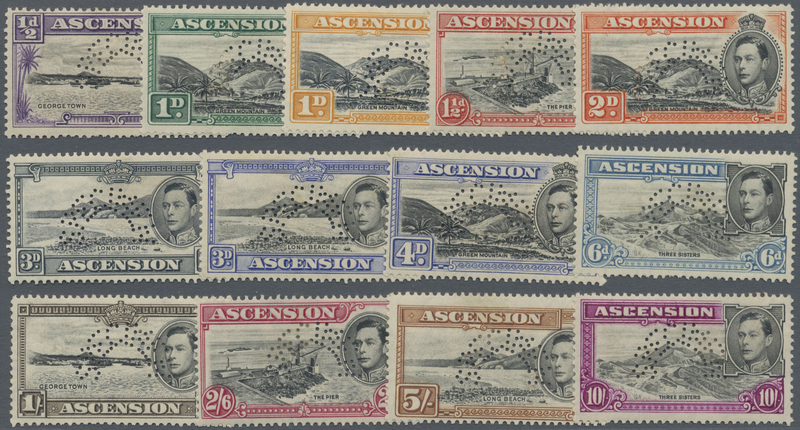 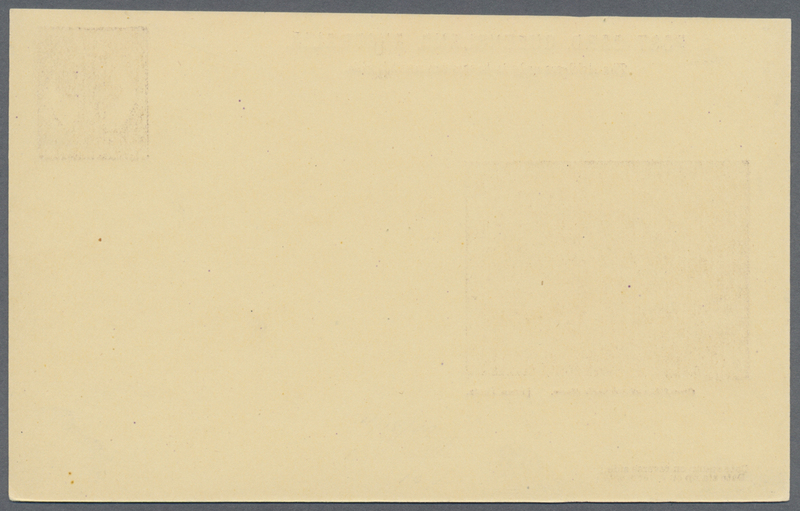 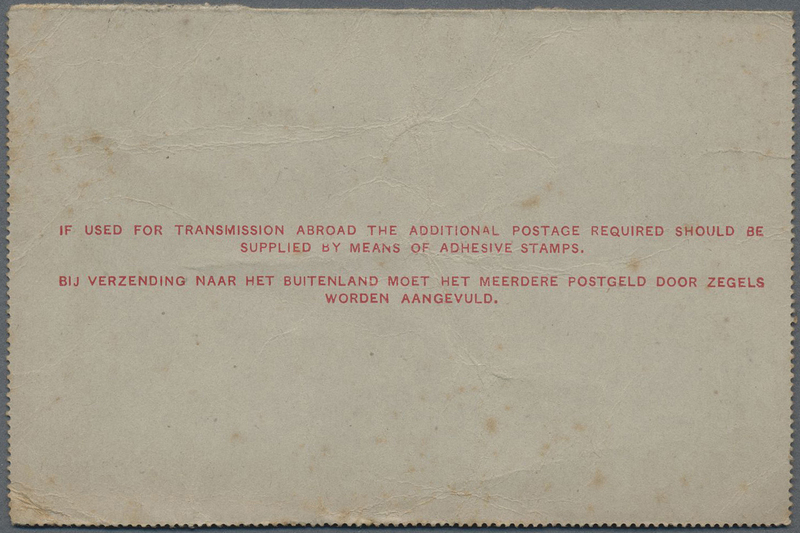 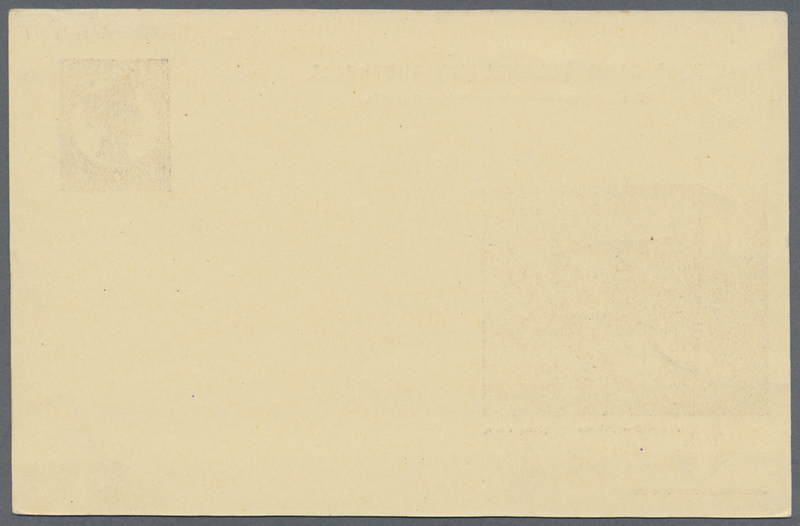 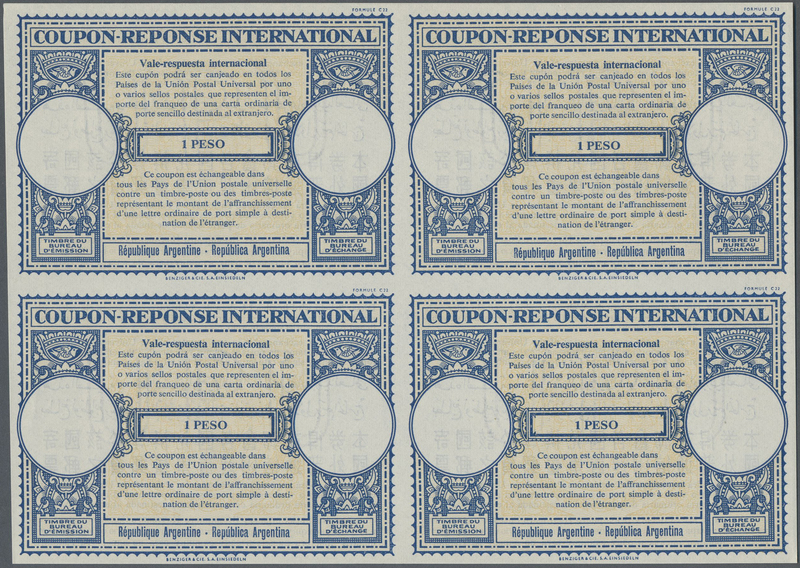 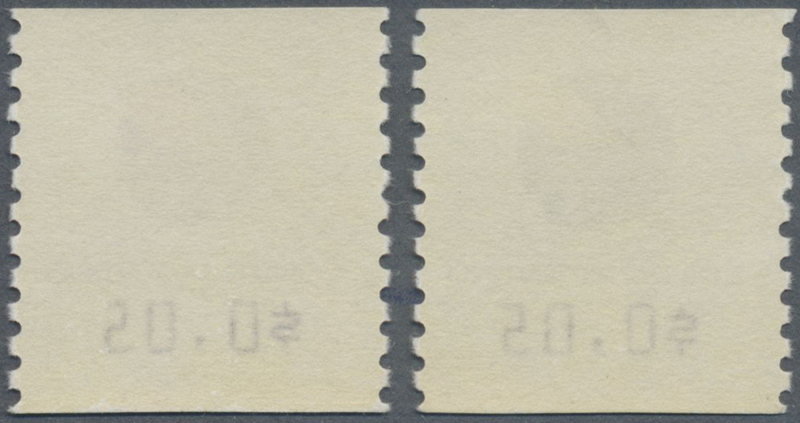 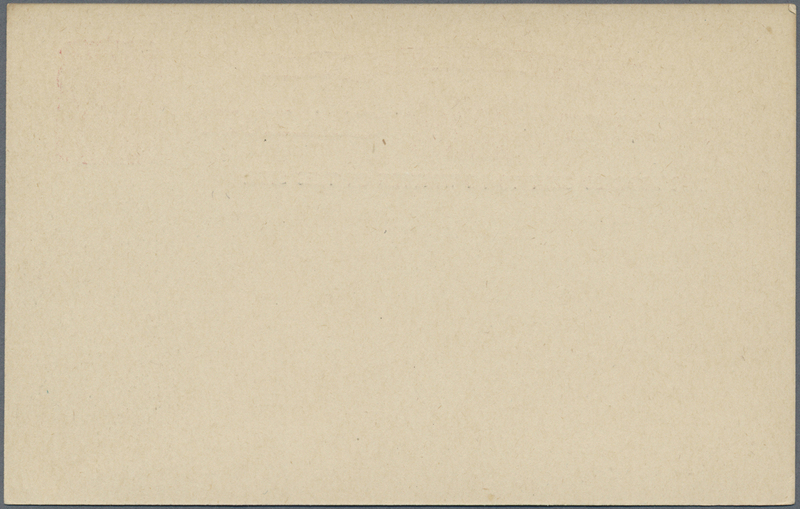 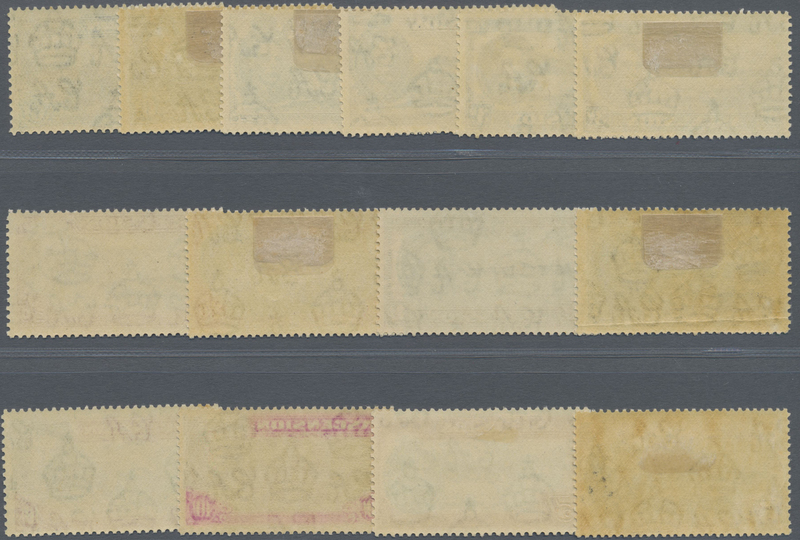 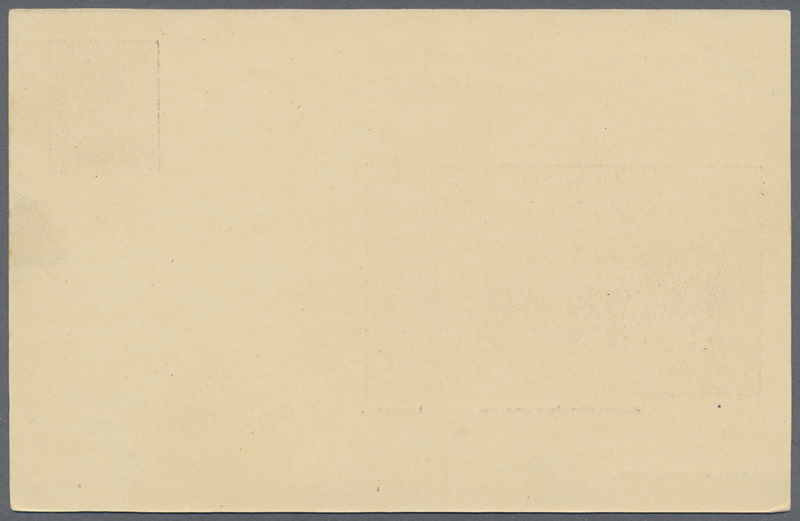 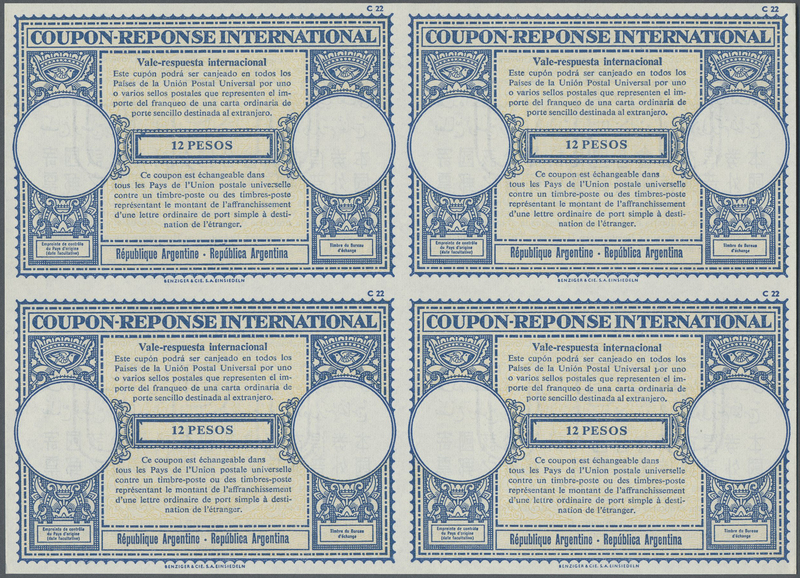 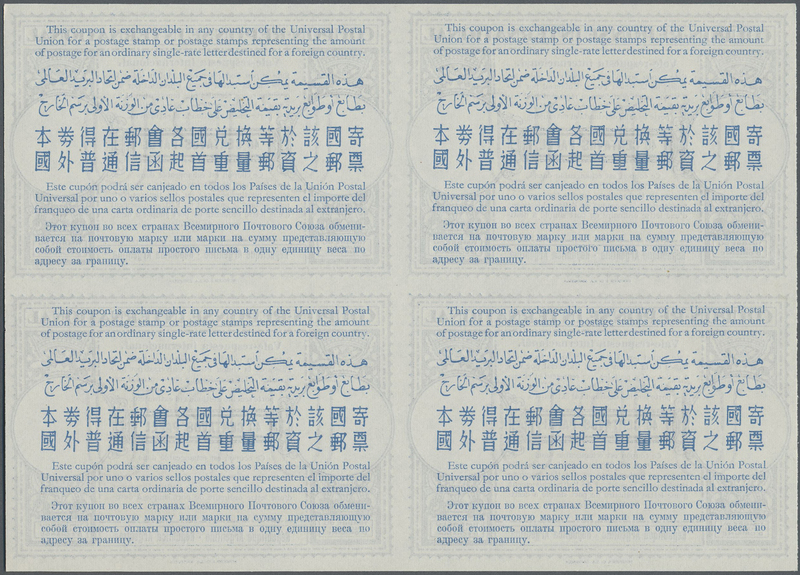 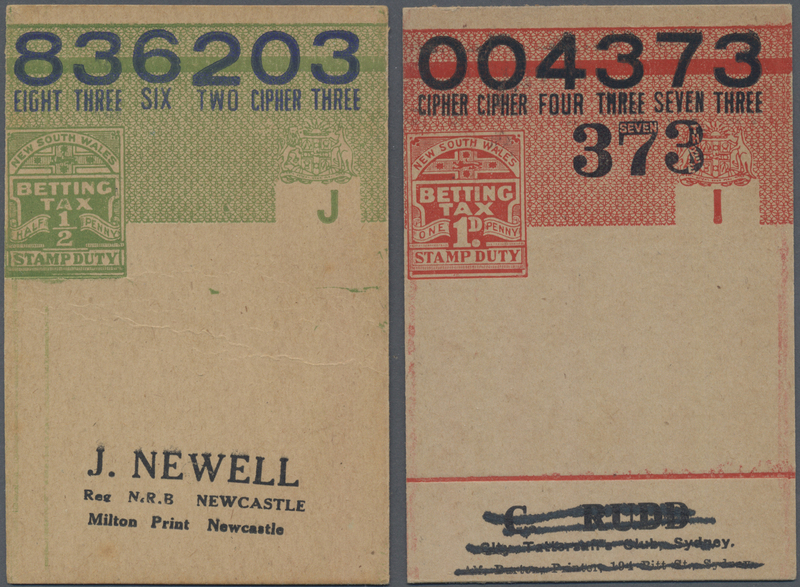 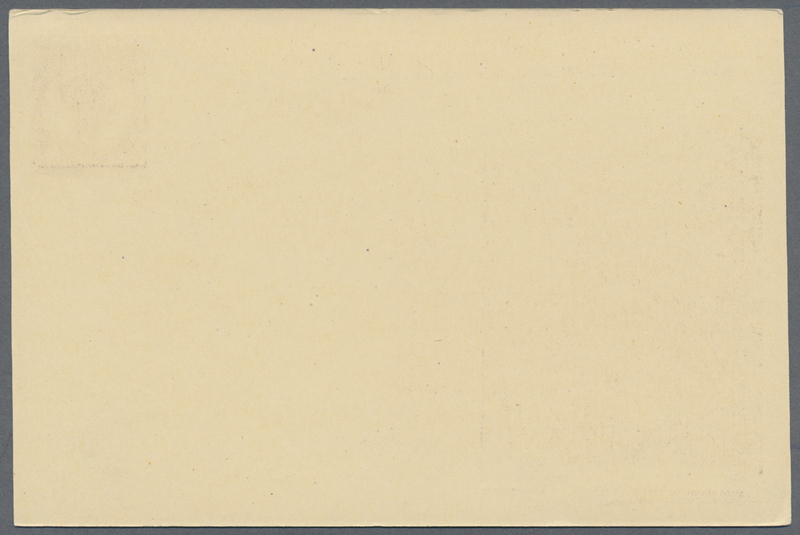 On reverse backstamps of London and Anvers (Belgique). 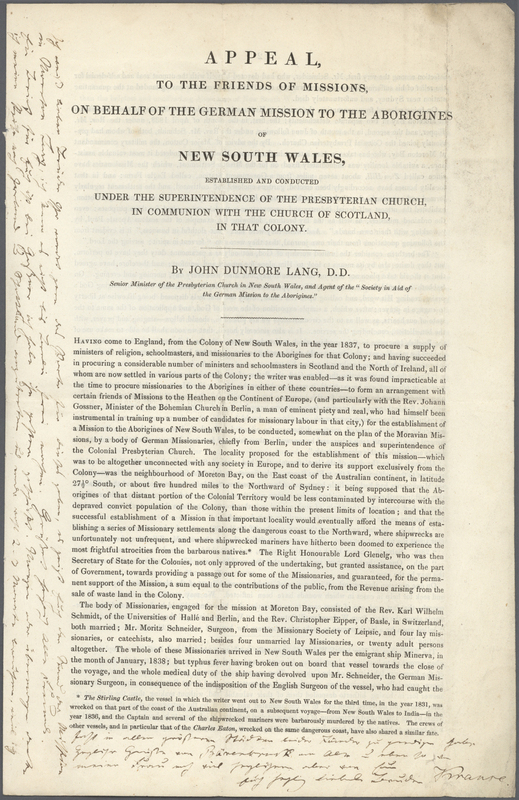 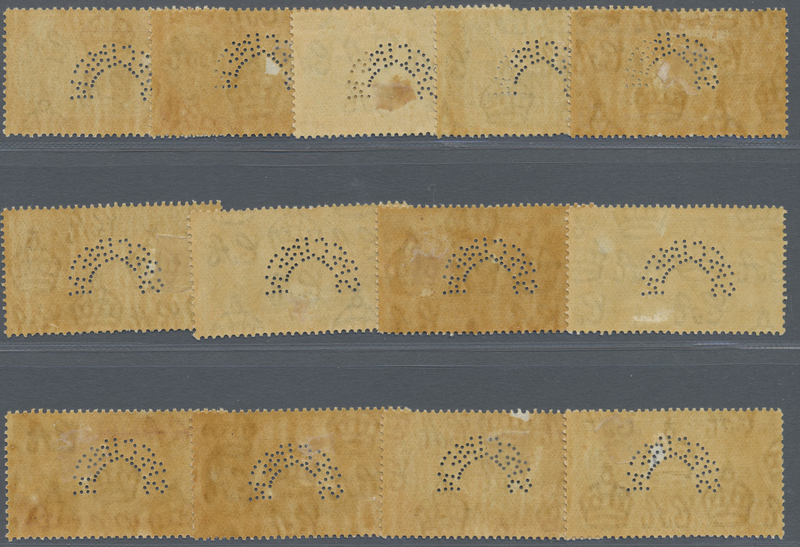 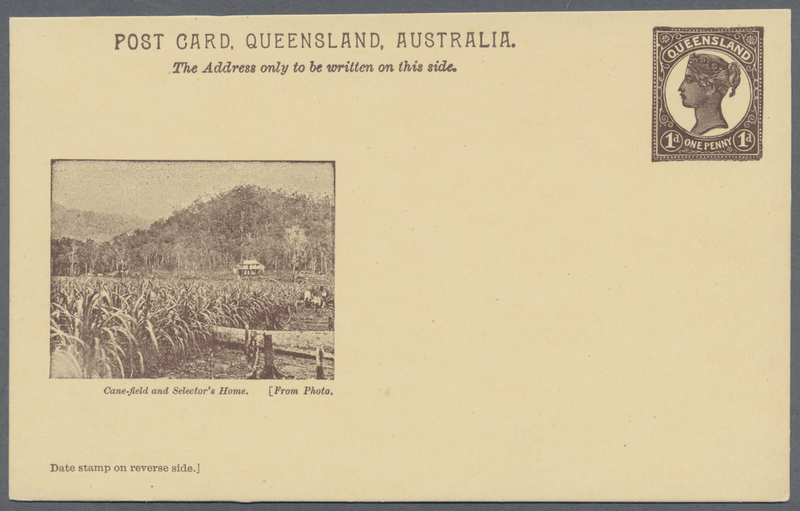 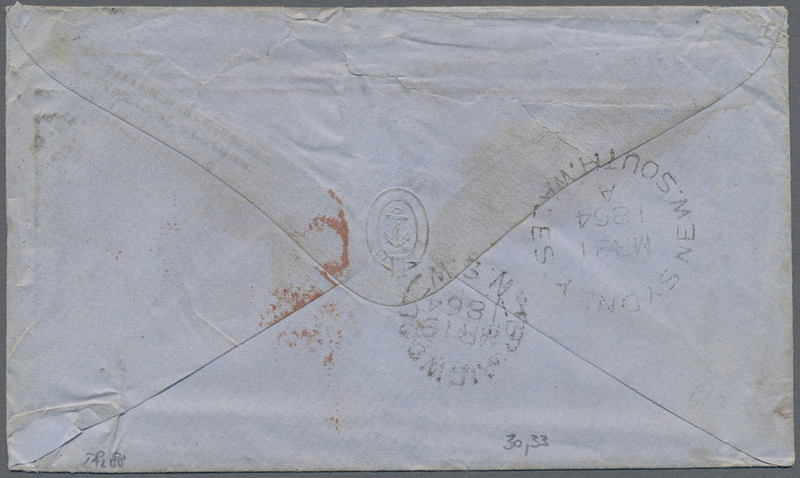 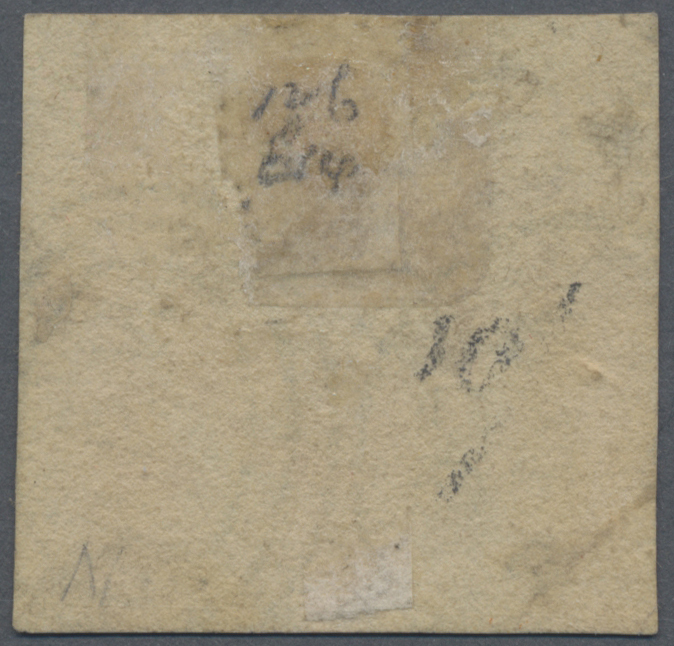 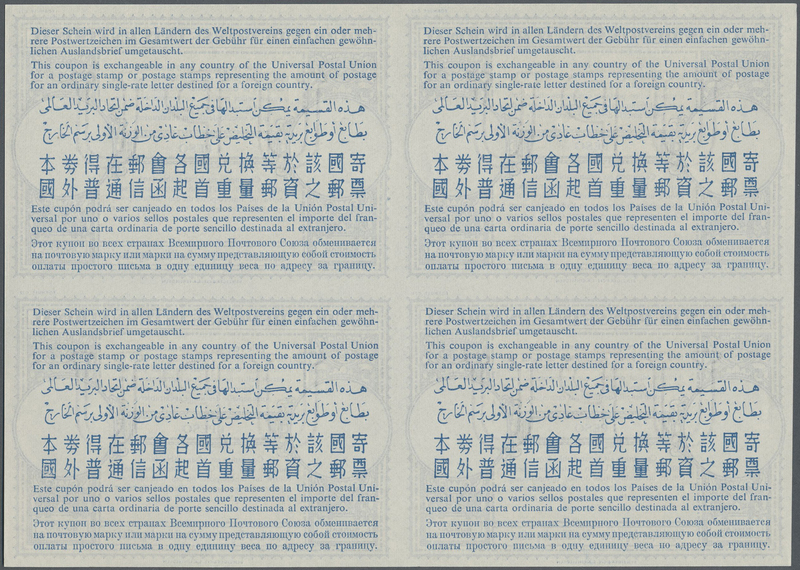 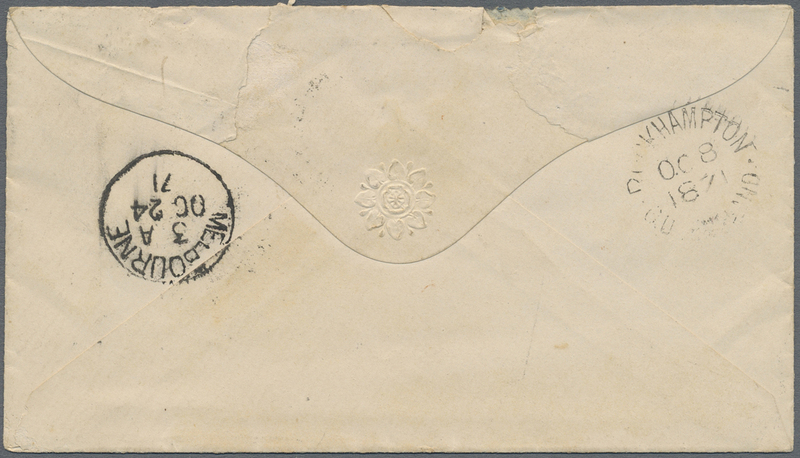 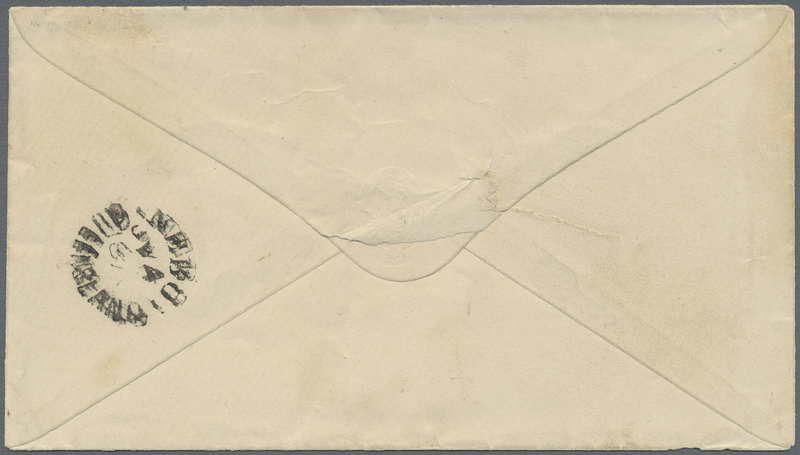 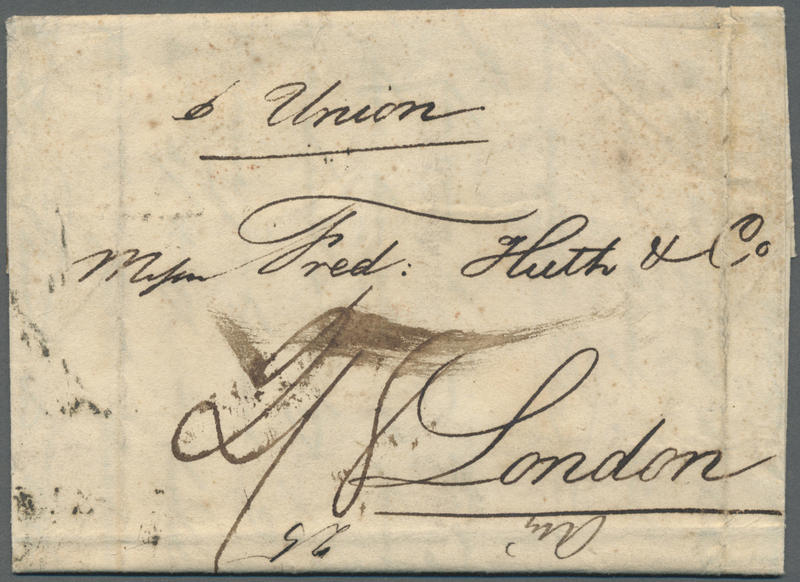 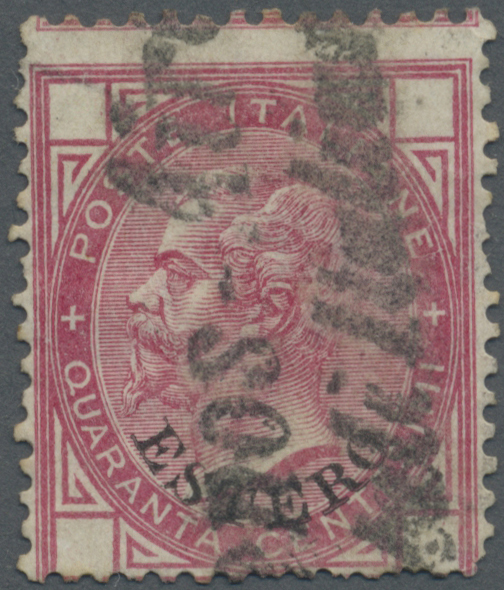 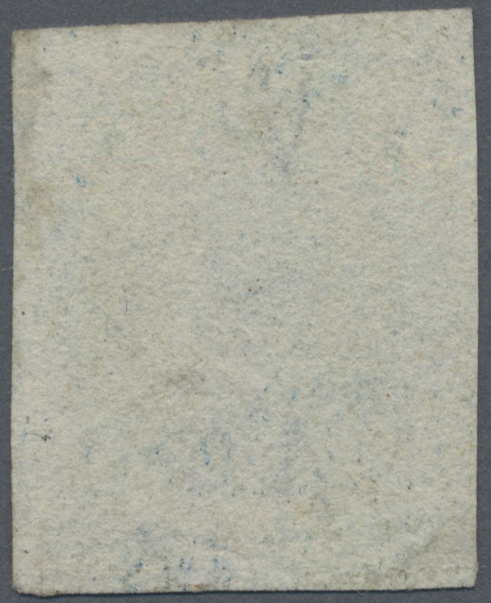 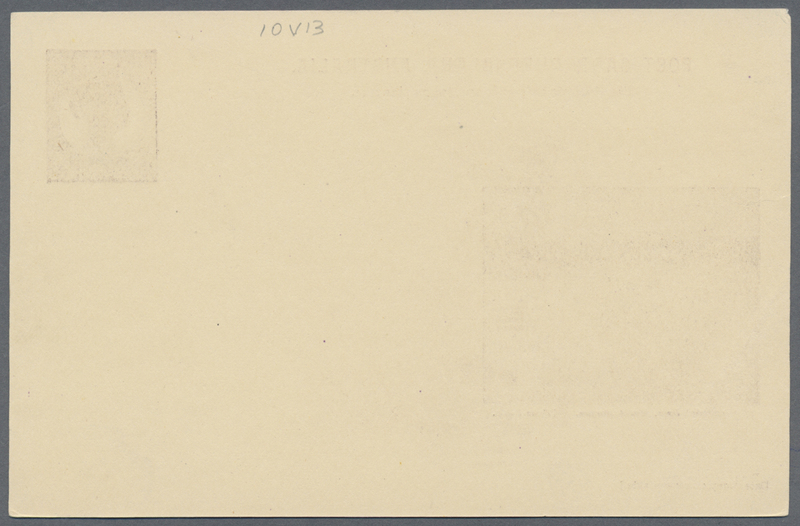 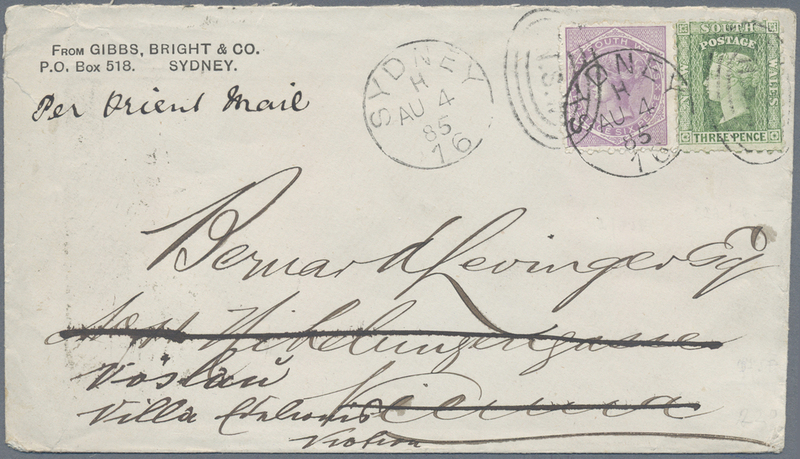 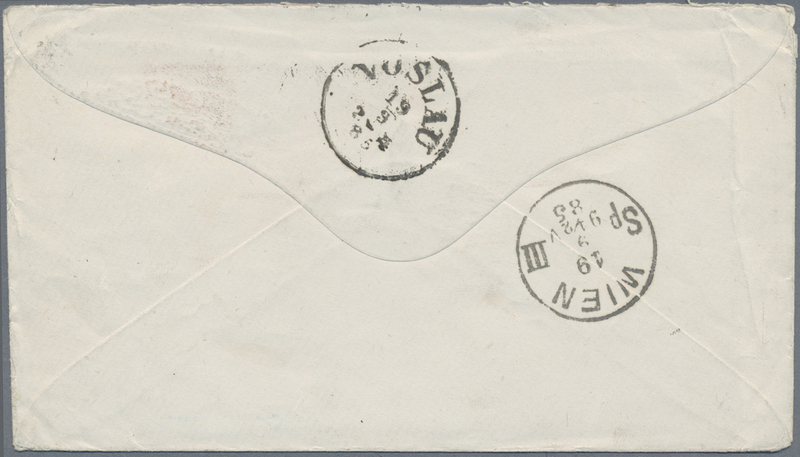 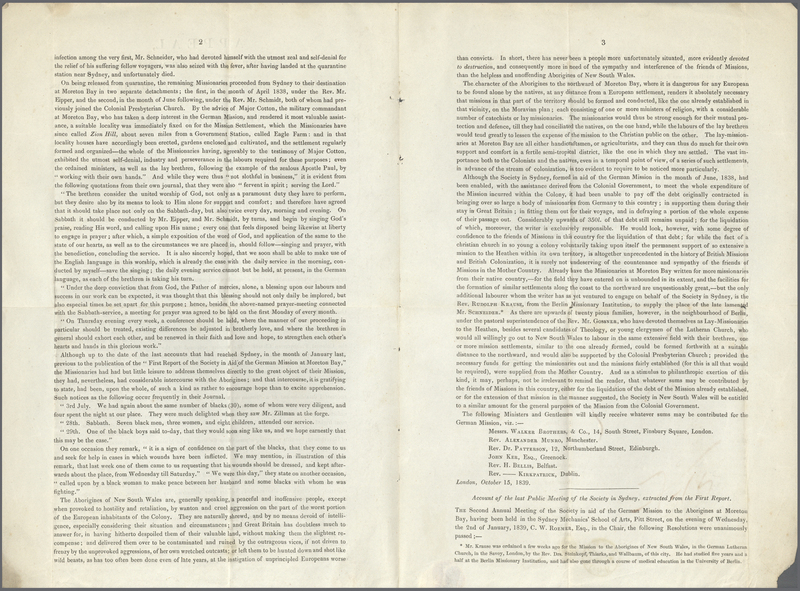 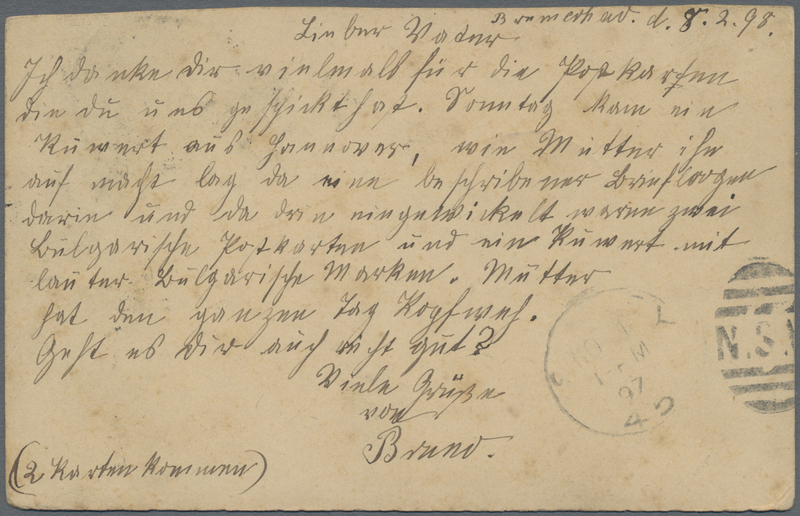 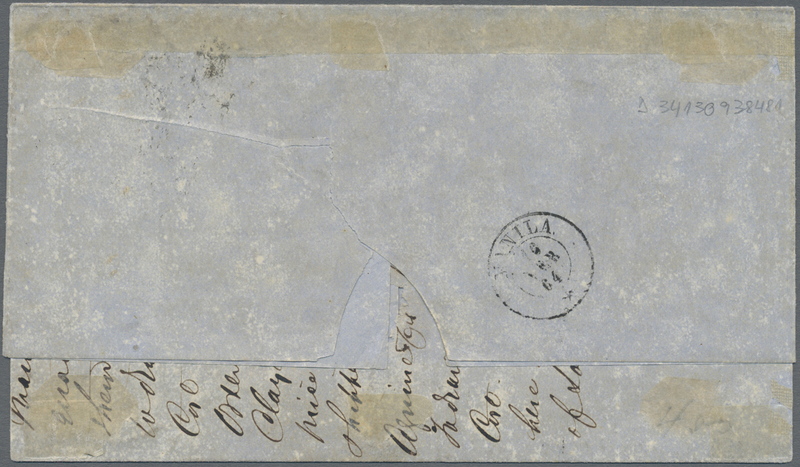 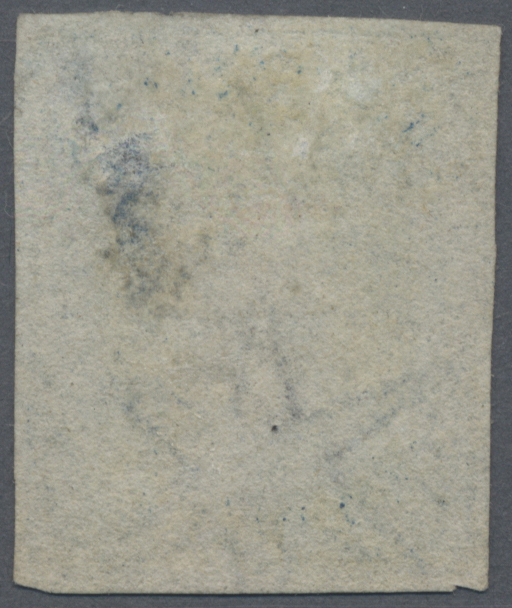 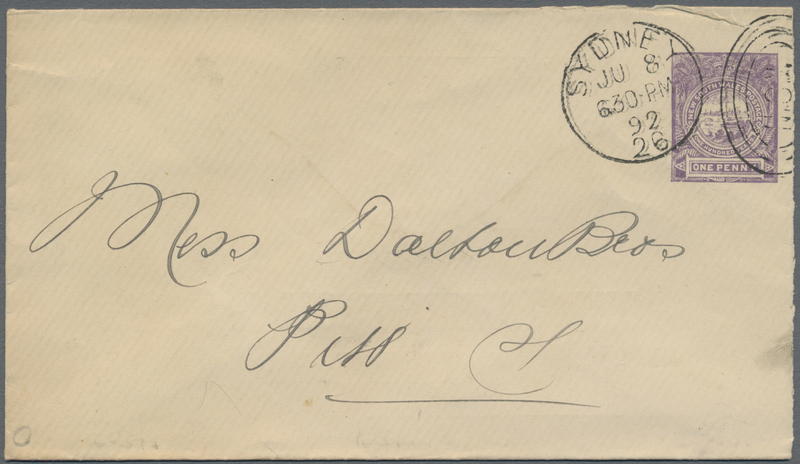 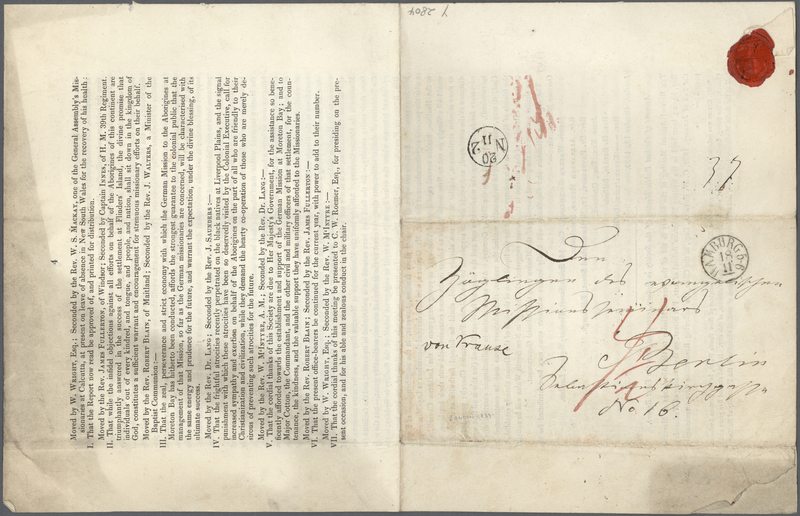 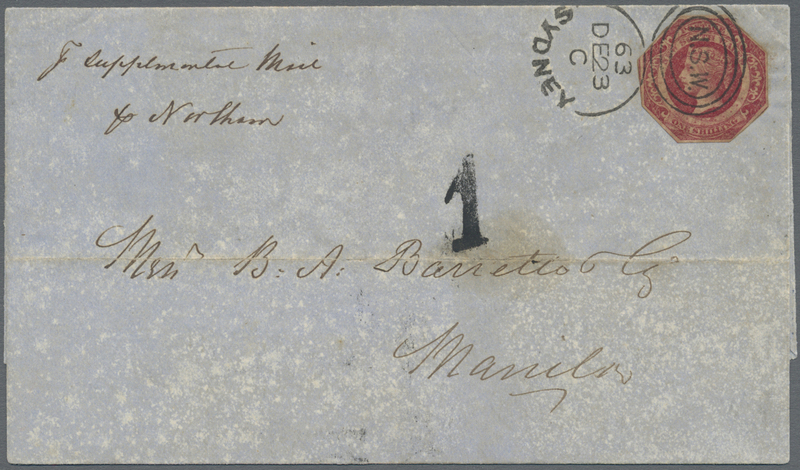 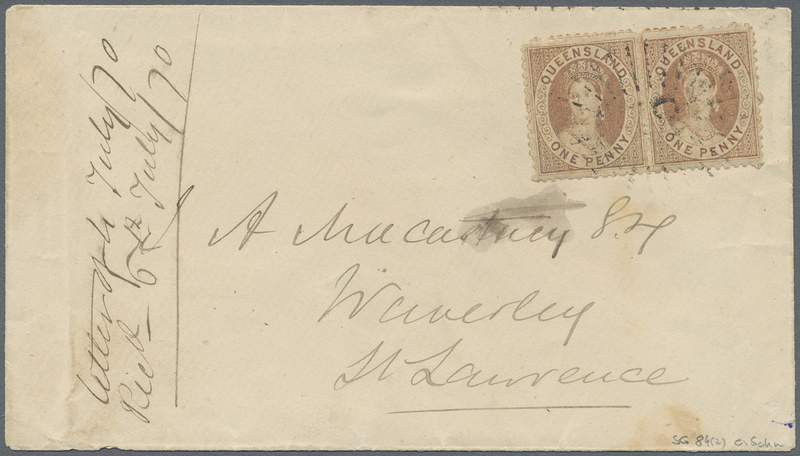 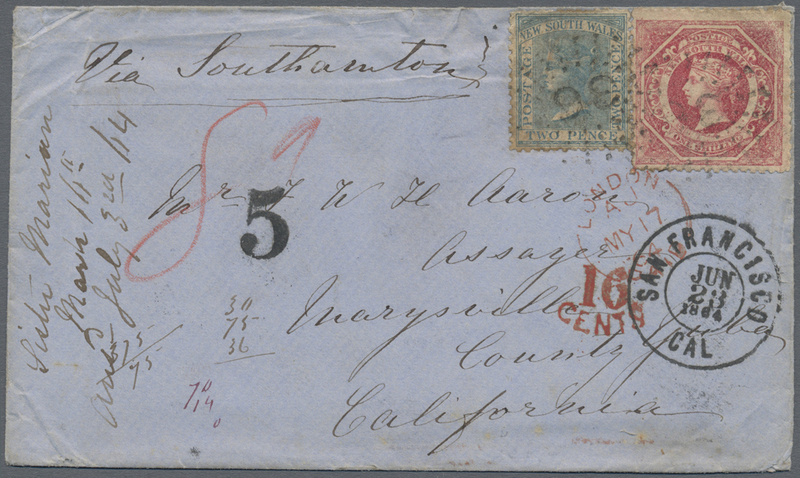 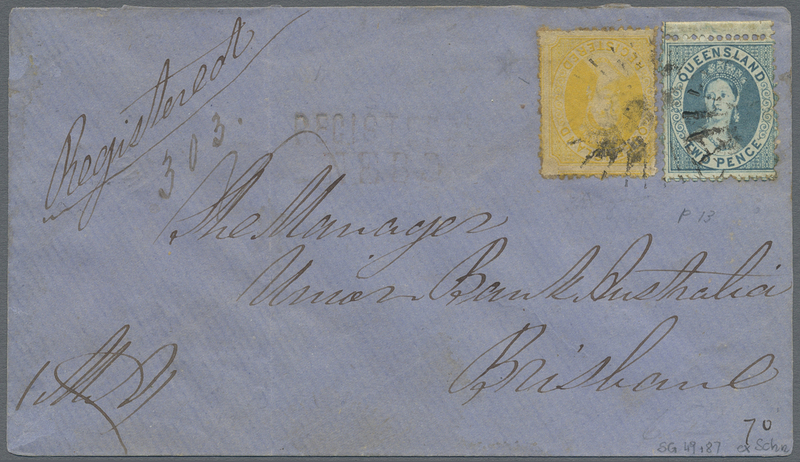 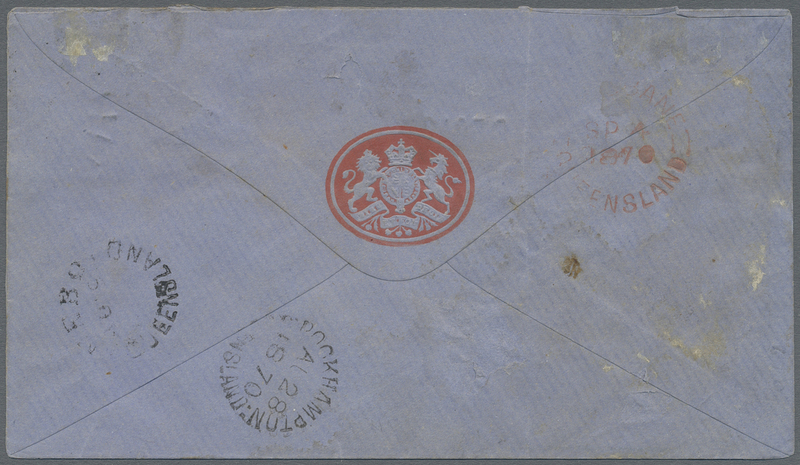 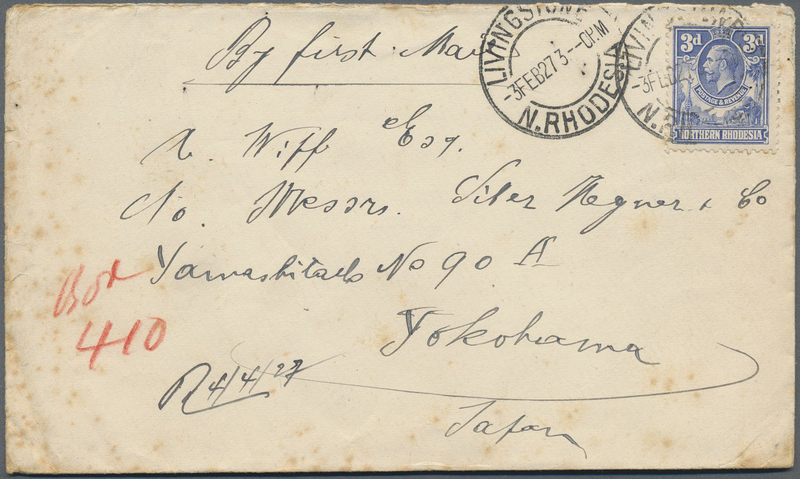 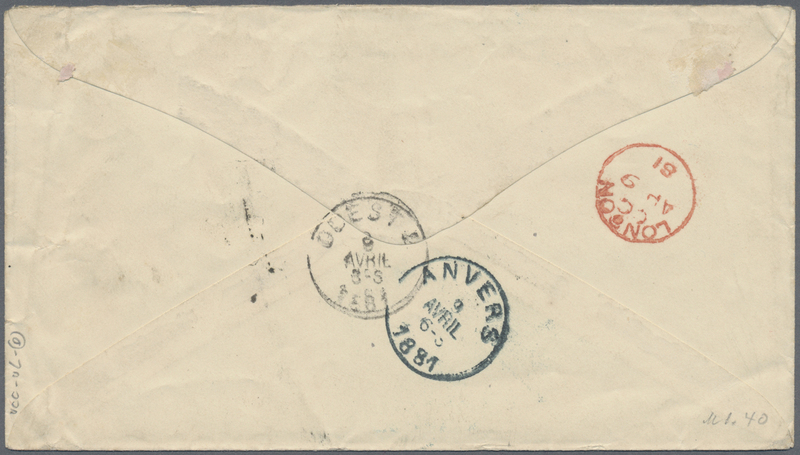 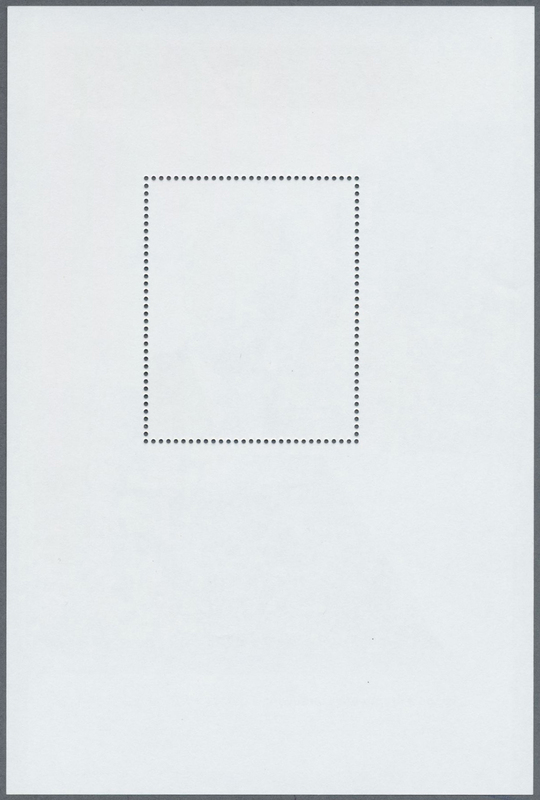 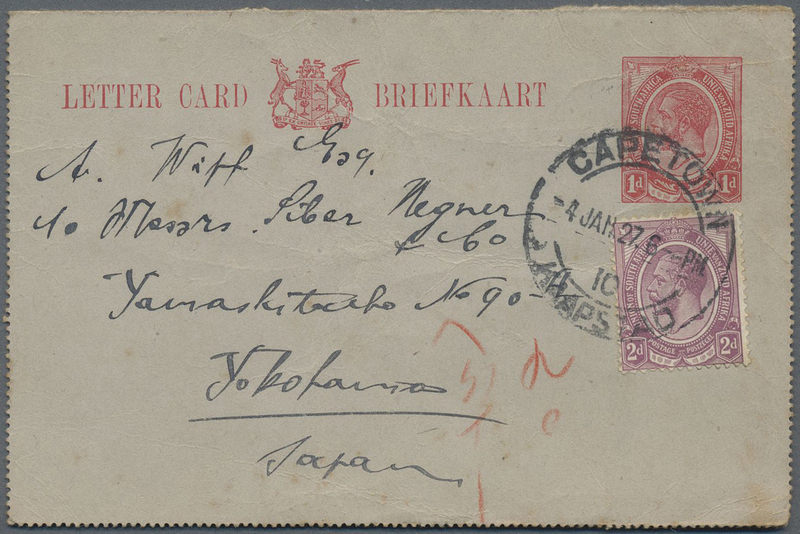 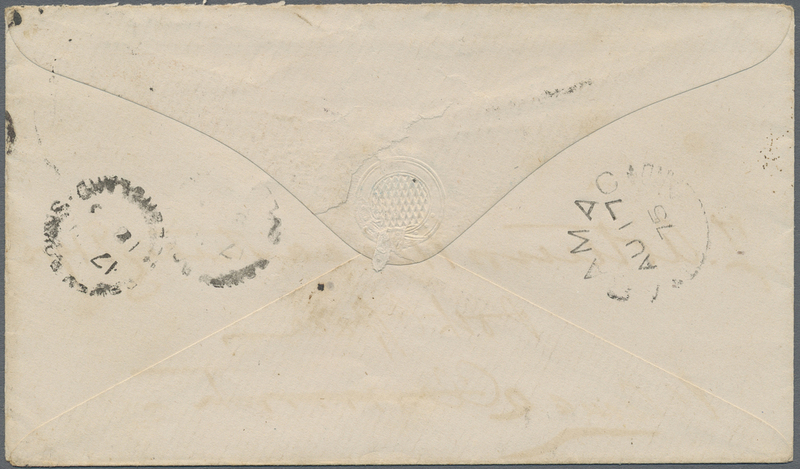 11315 Brief (cover) 1864, QV 1 Sh. 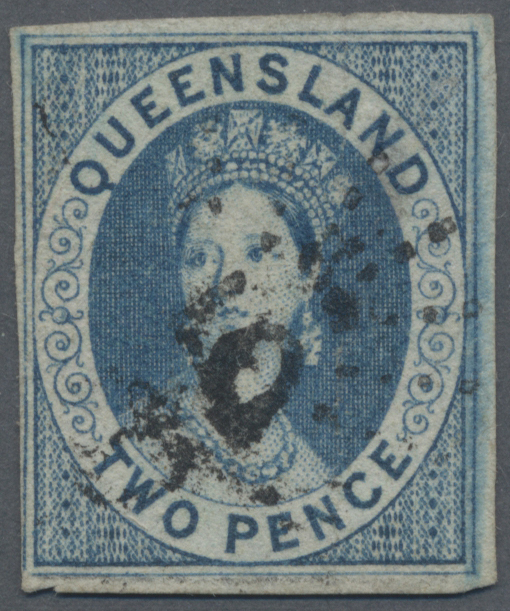 and 2 d. canc. 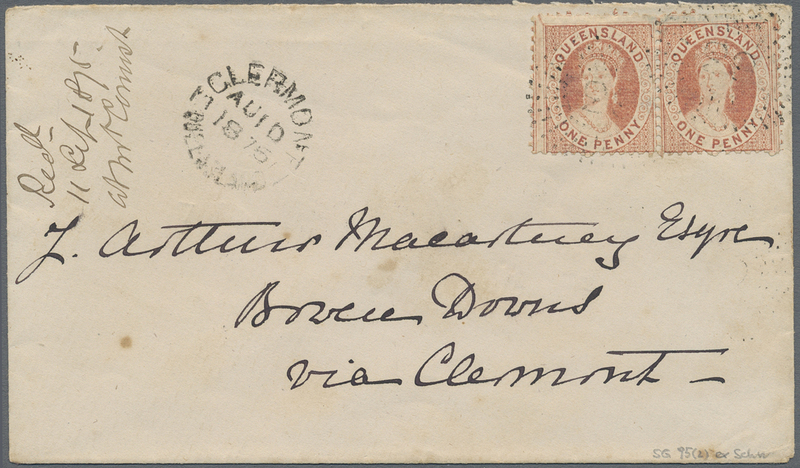 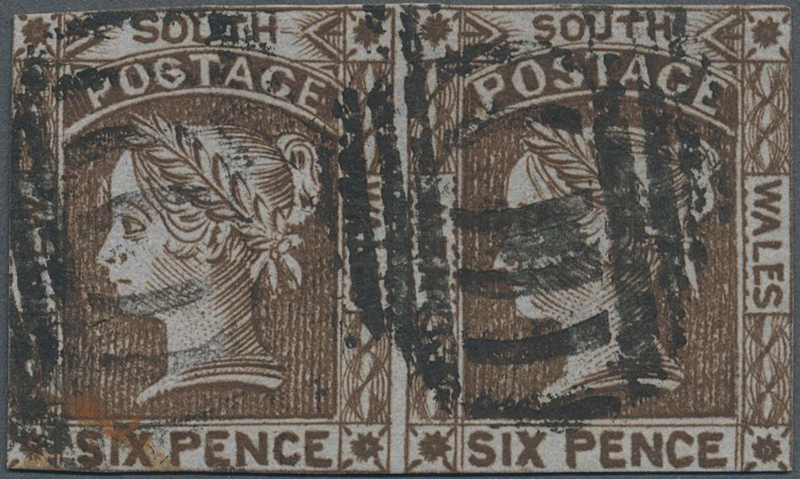 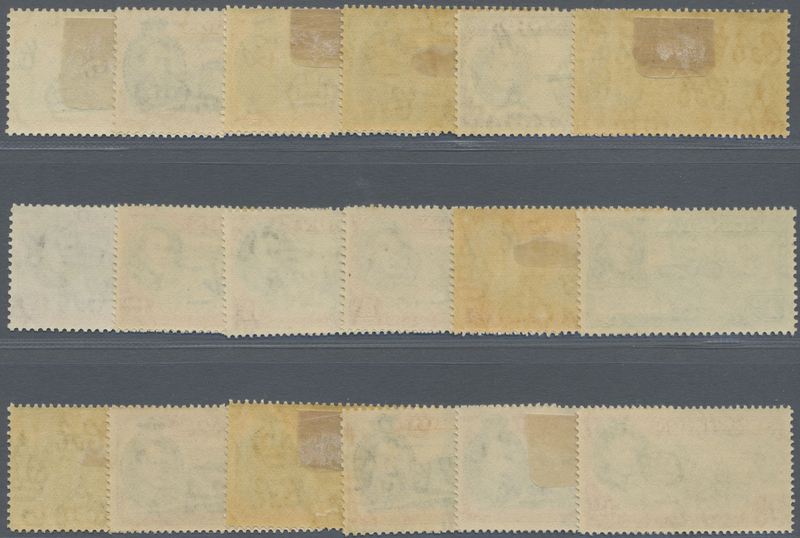 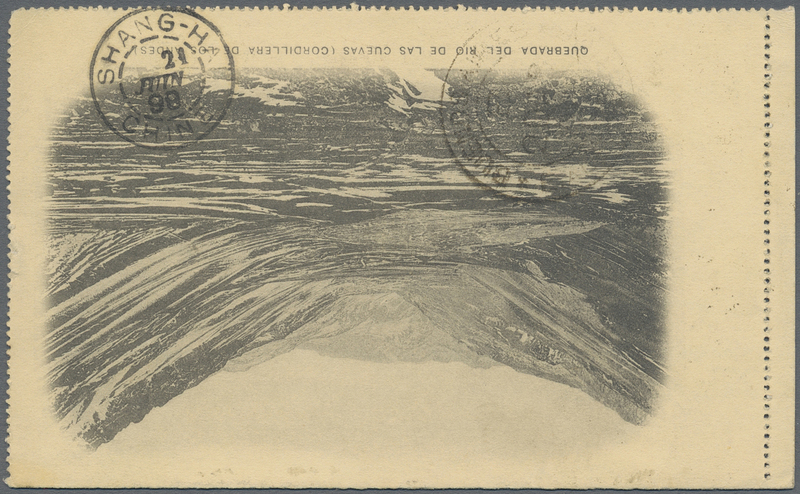 "36" on cover endorsed "Via Southampton" to California/USA, marked "5" and red "16/CENTS", on reverse "BRAIDWOOD MR 19 1864 N.S.W. 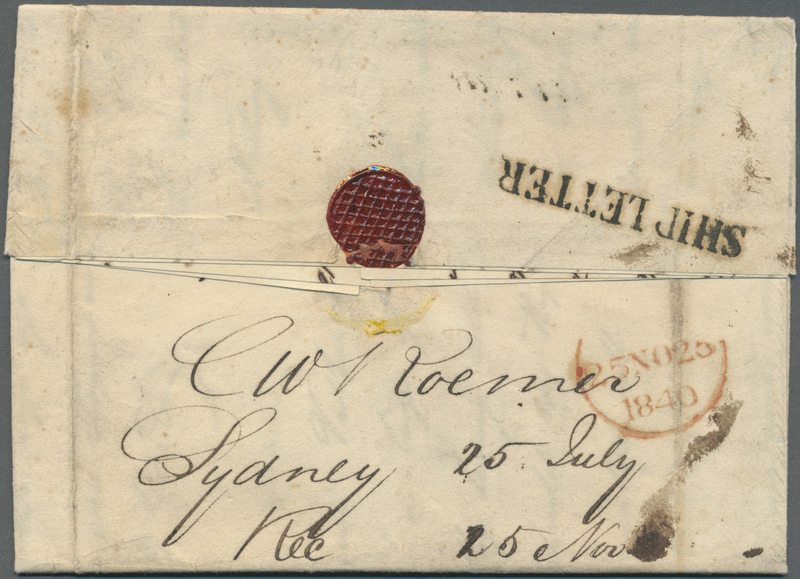 ", "SYDNEY MR 21 1864", also red "LONDON MY 17 64" and "SAN FRANCISCO JUN 23 1864". 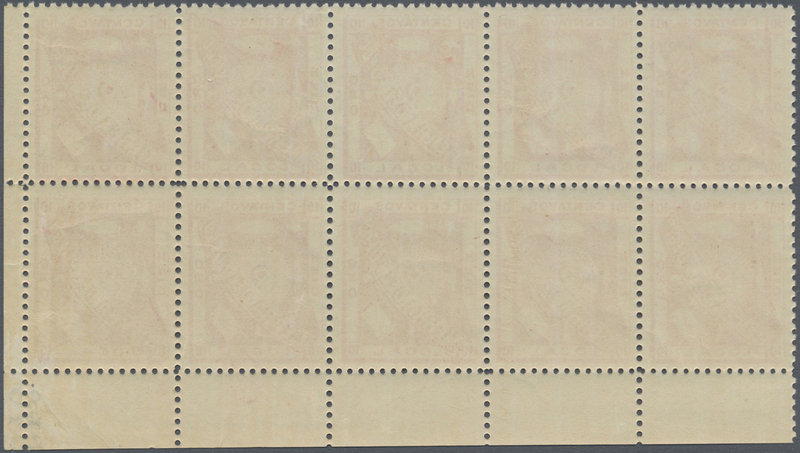 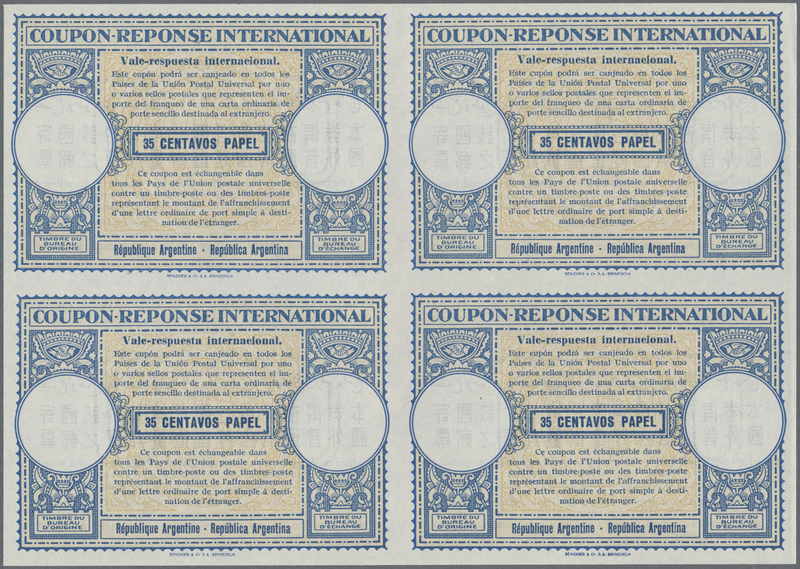 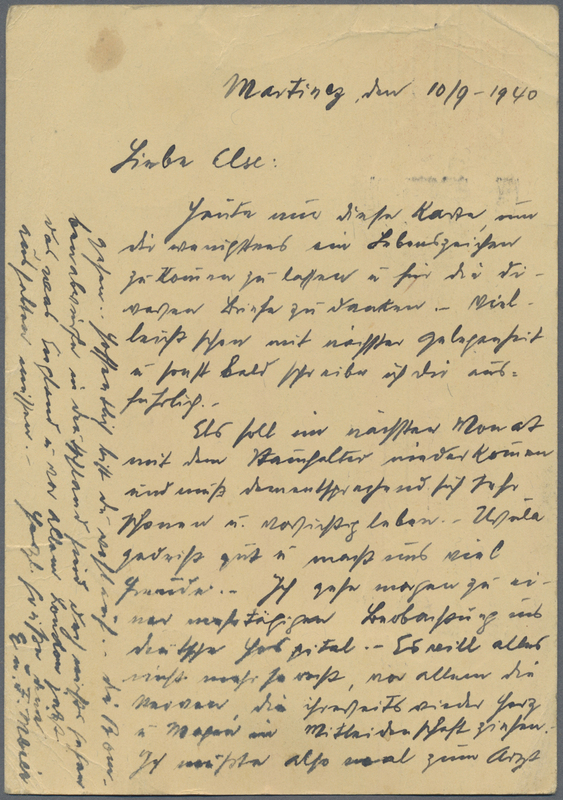 11323 Ganzsache (Complete) P 21 (2) 1904 (ca. 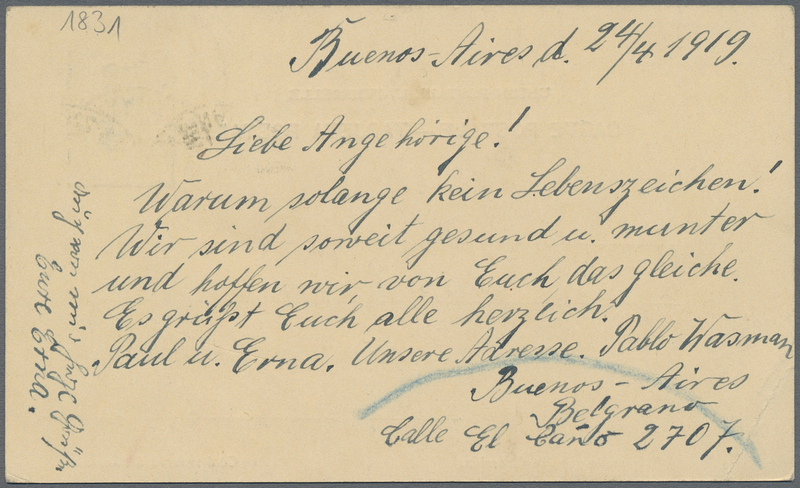 ), stat. 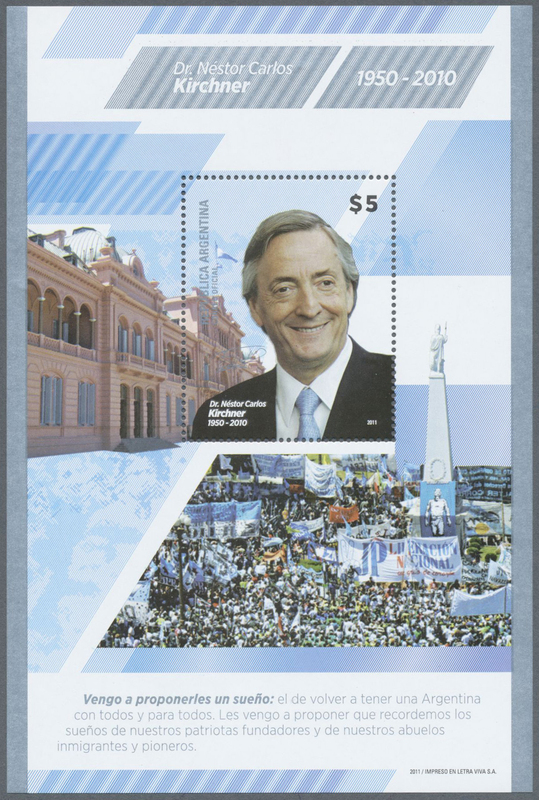 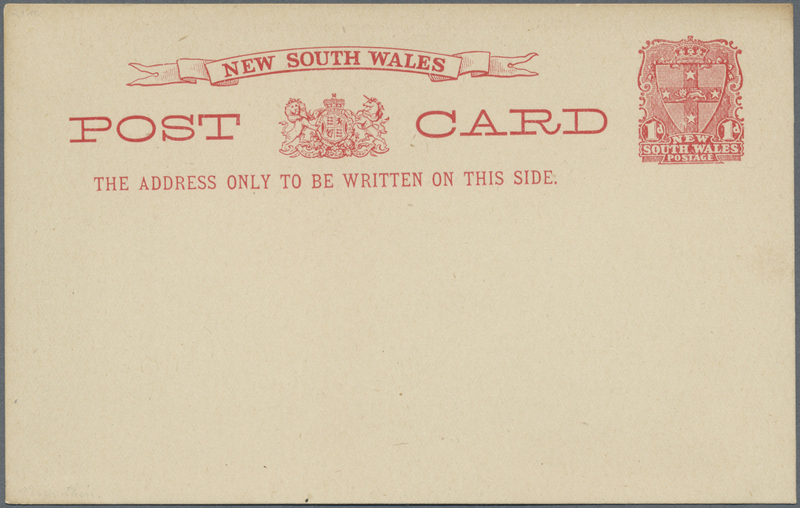 postcard 1d. 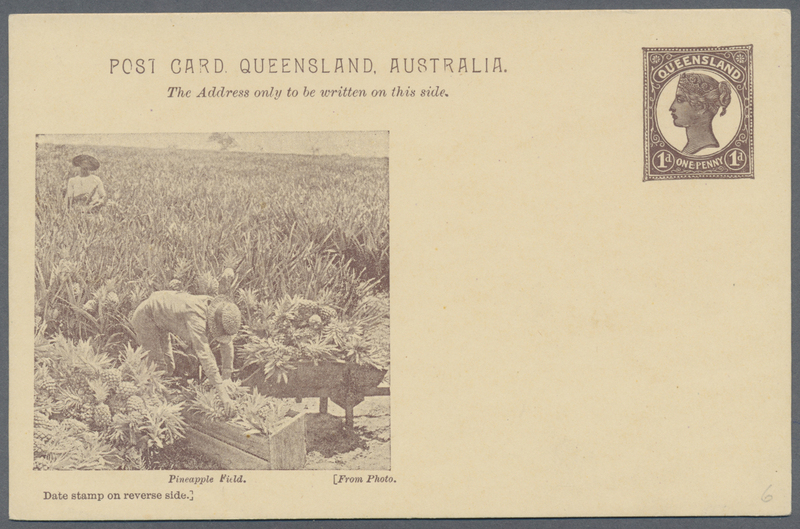 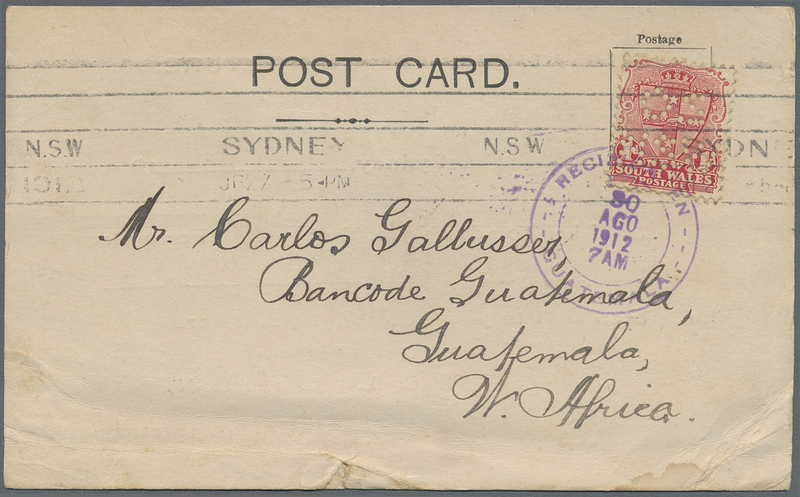 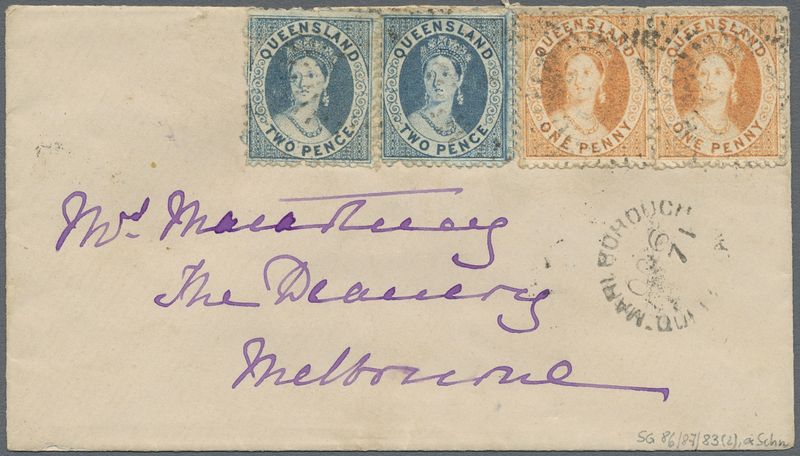 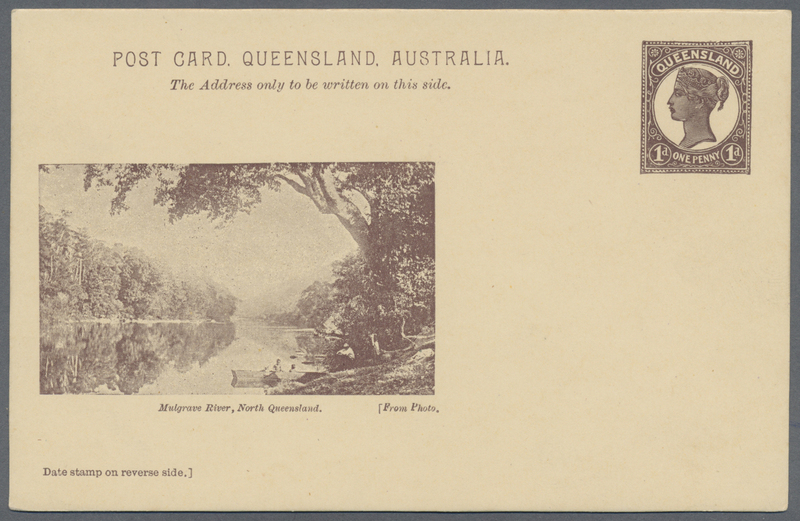 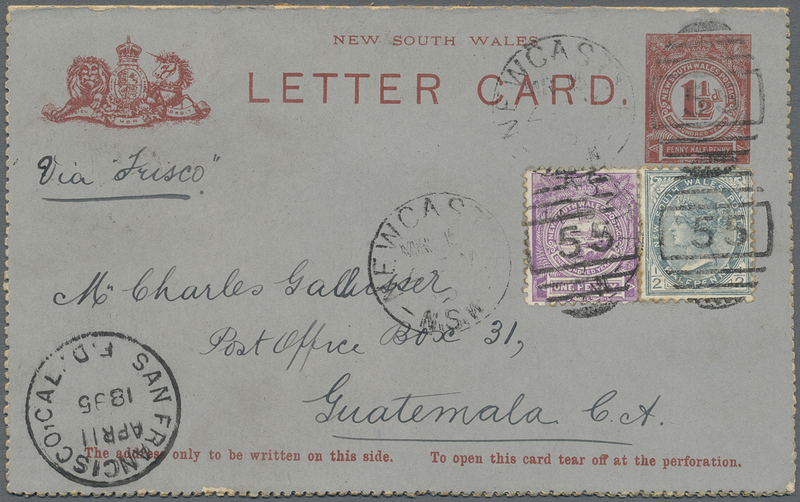 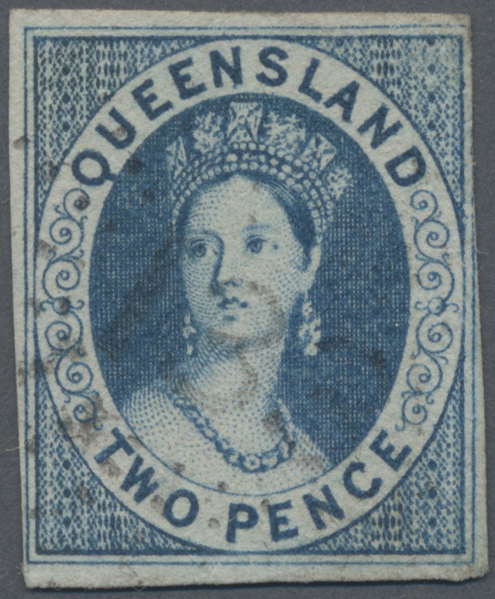 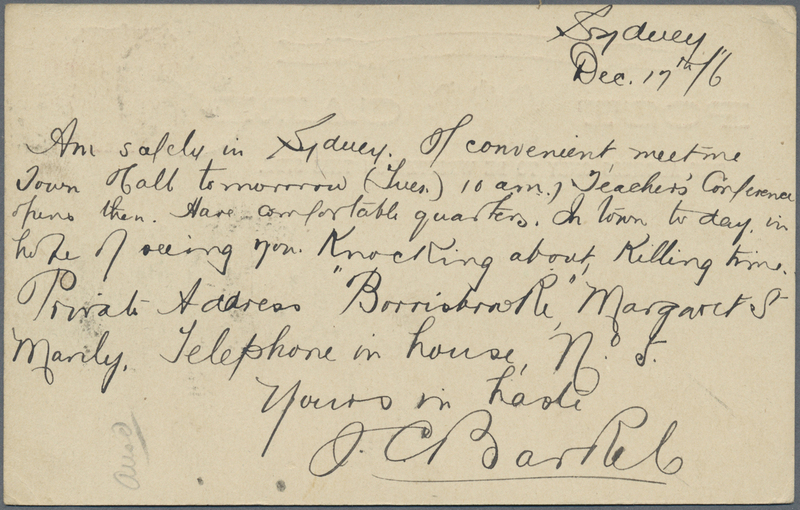 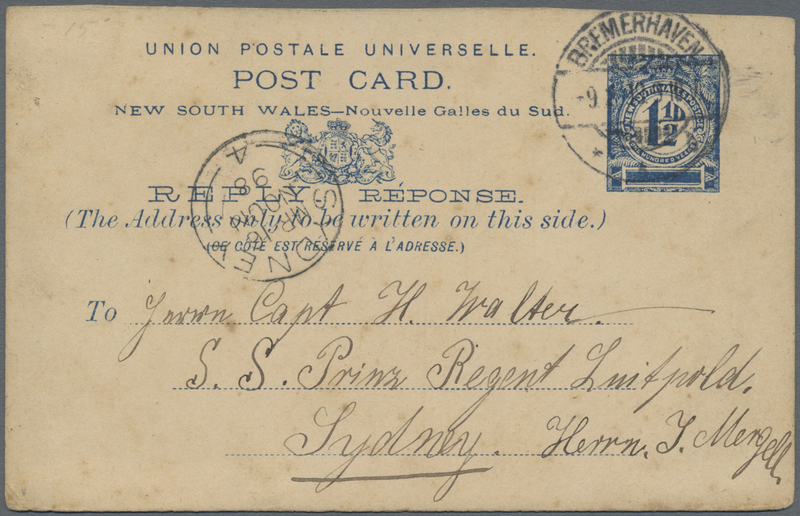 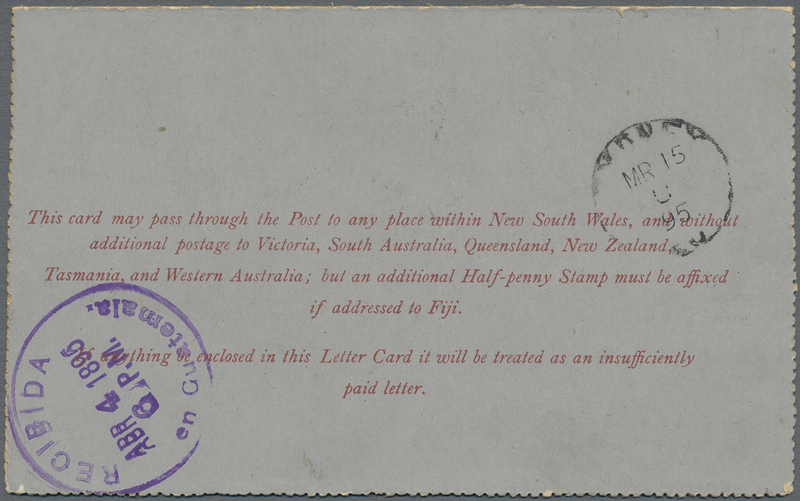 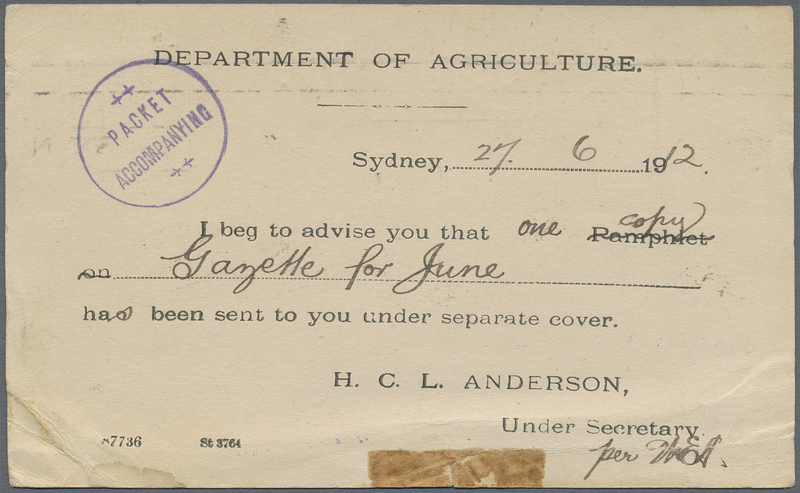 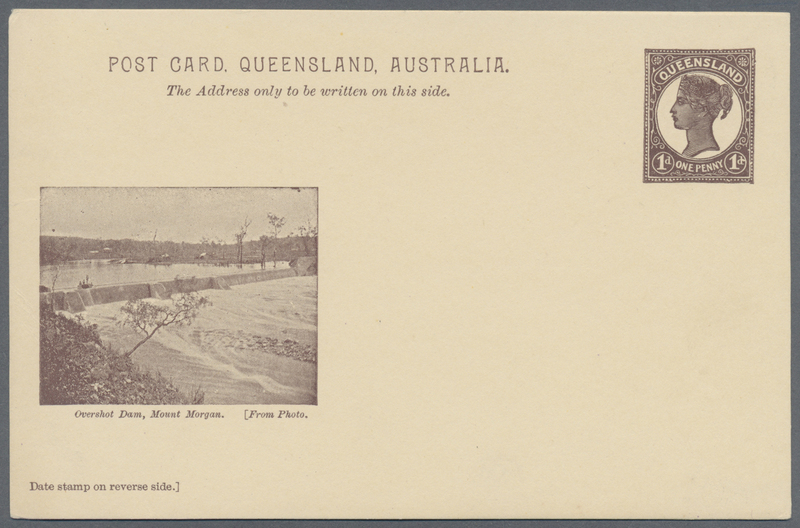 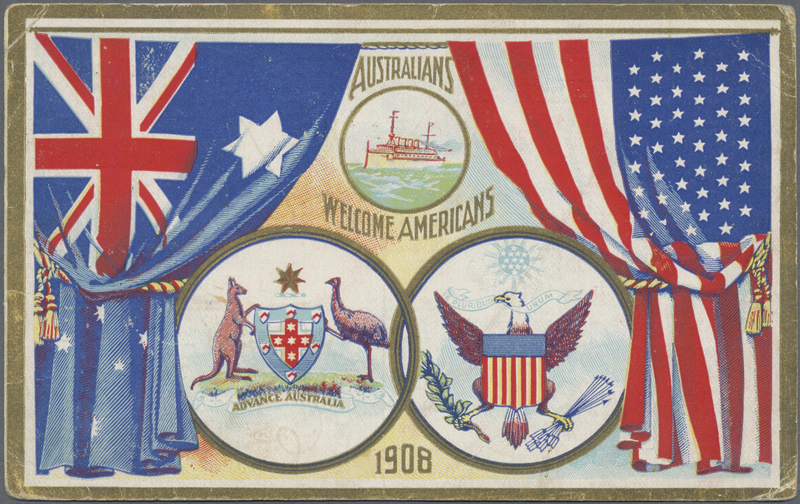 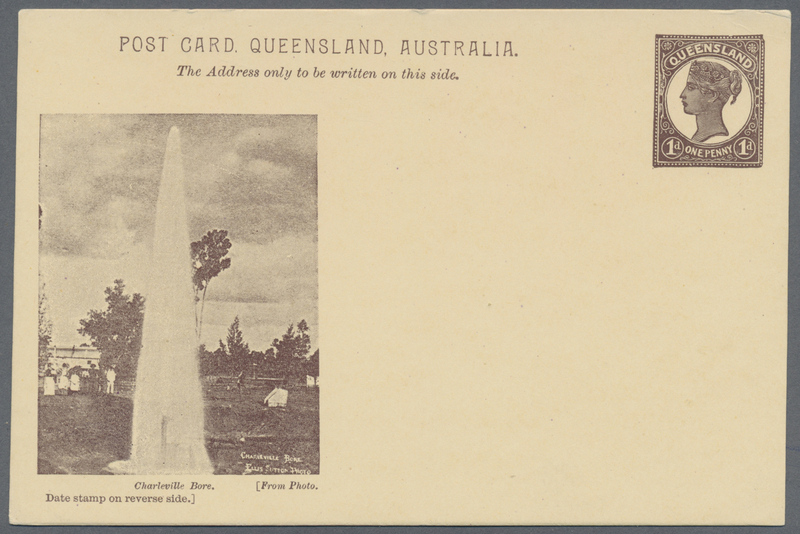 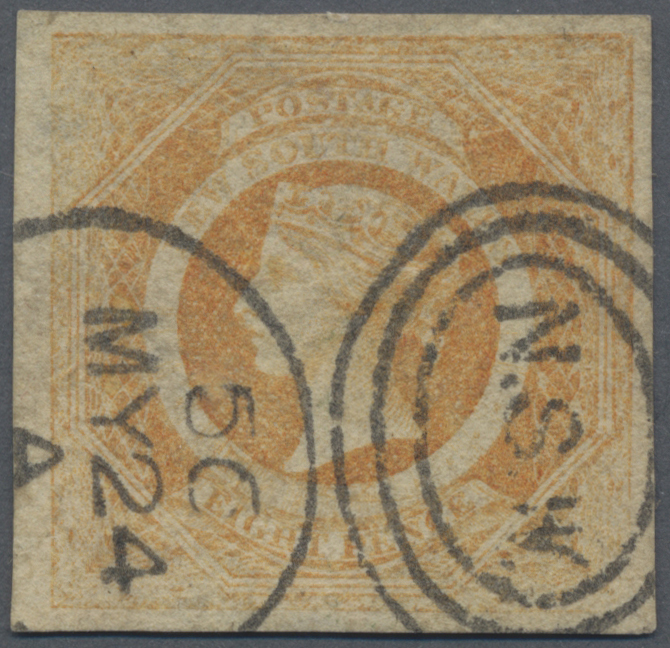 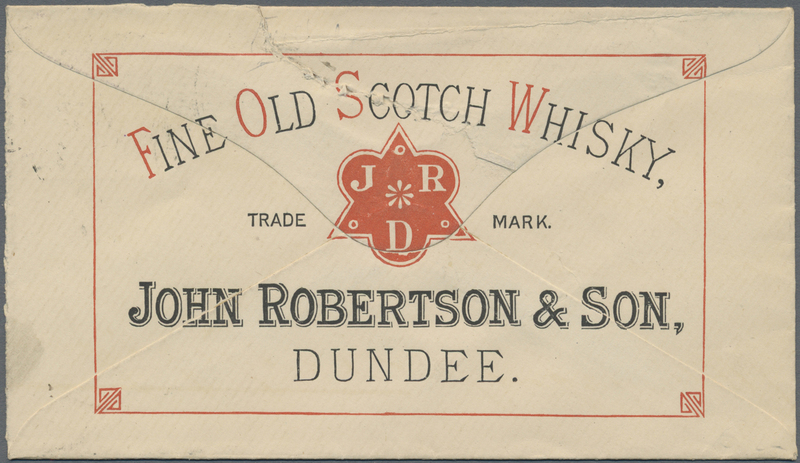 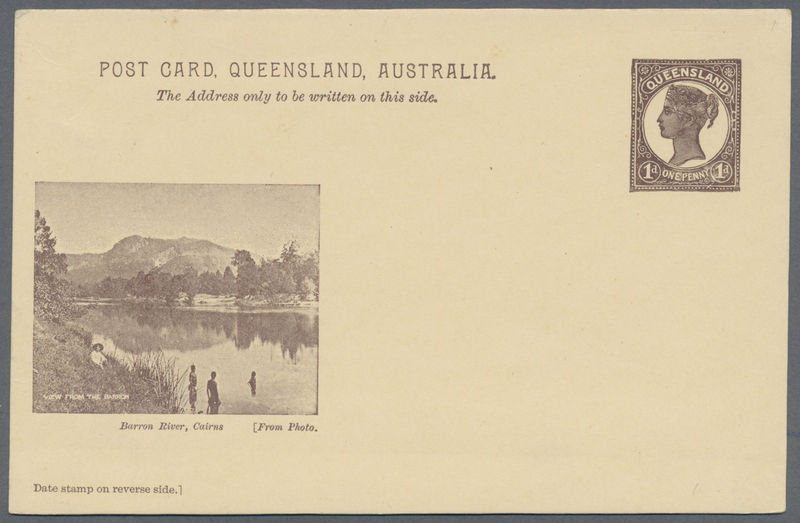 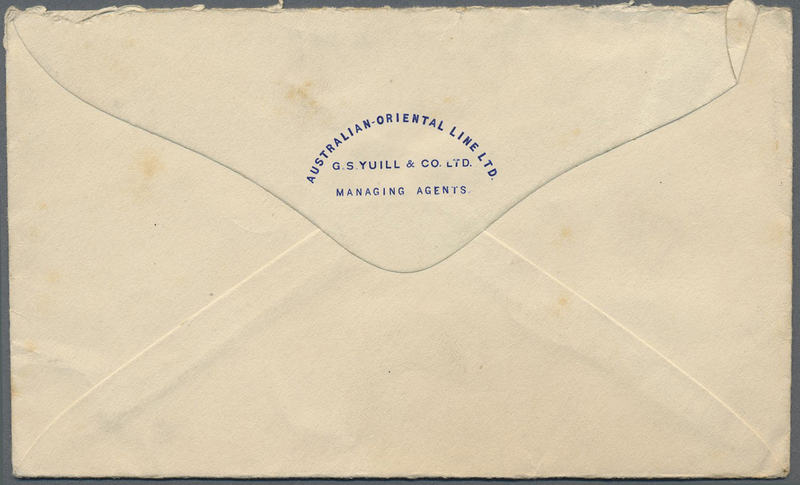 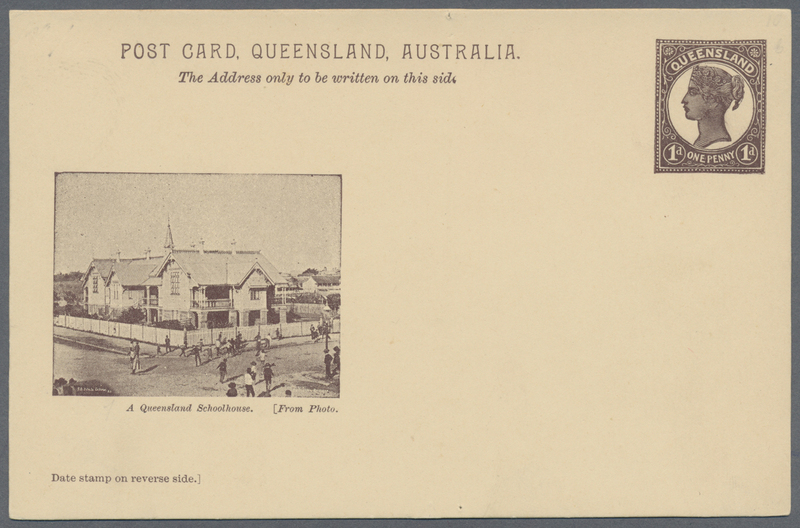 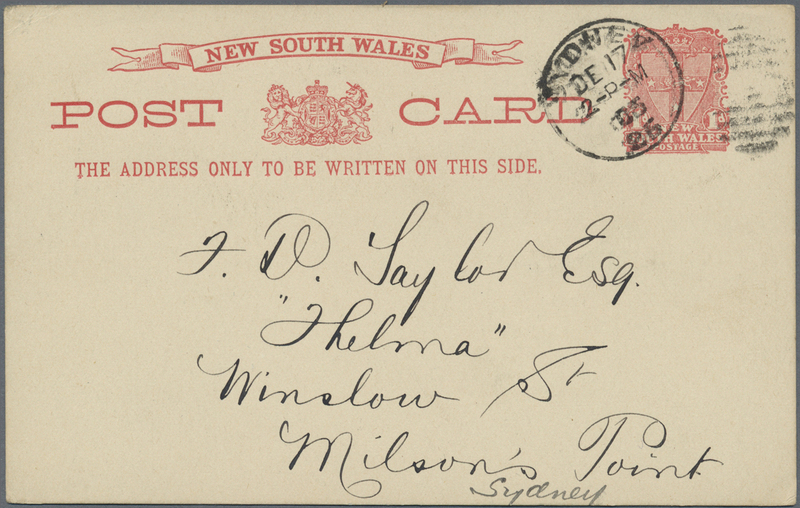 arms with third line on front 'THE ADDRESS ONLY........' with serifs unused and fine used within Sydney (DE17/05), attractive pair of this very scarce postcard type with only few survived and missing in most collections! 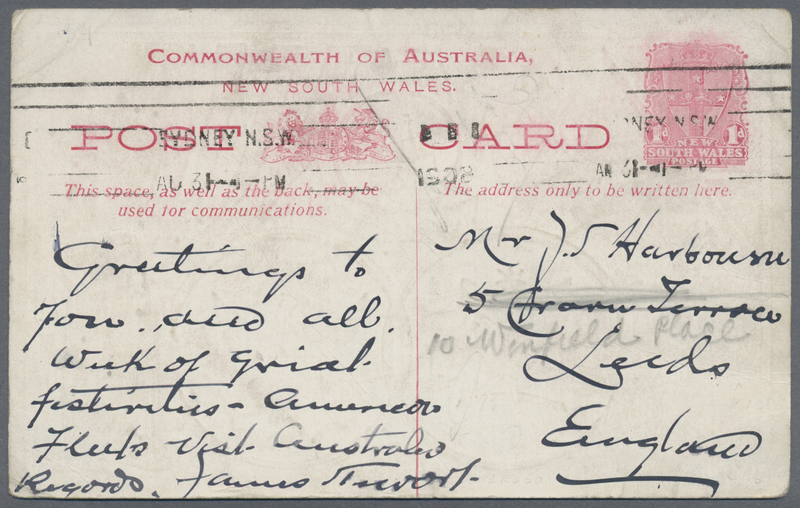 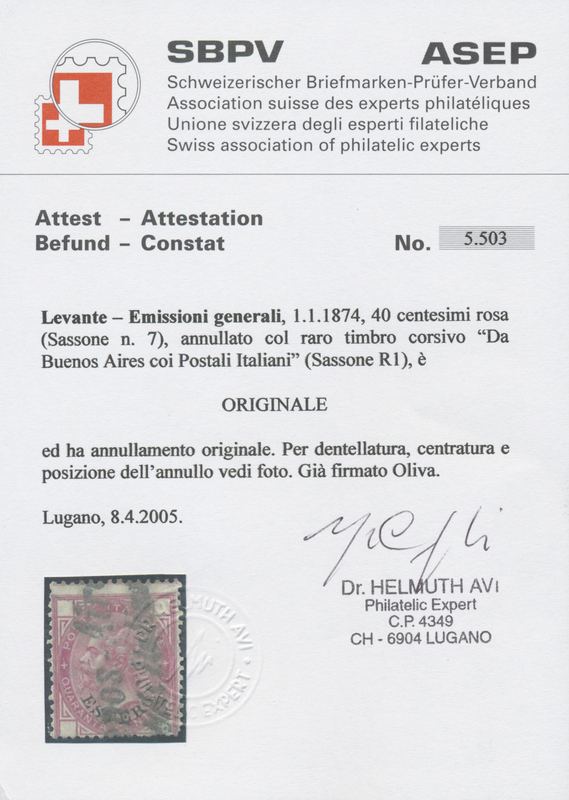 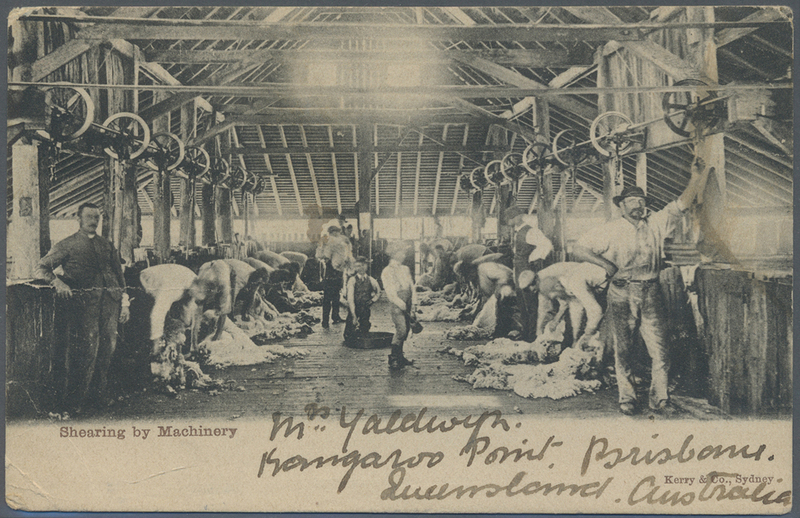 11331 Ansichtskarte (Picture postcard) 1906, 1 Penny red on picture postcard "Shearing by Machinery black /withe" (World championship on Sheep shearing) send by steamship from "BRISBANE" via "COLOMBO JY 26 06" via "SUEZ 6 VIII 06" to "CONSTANTINOPEL LEVANT (apmk british post office). 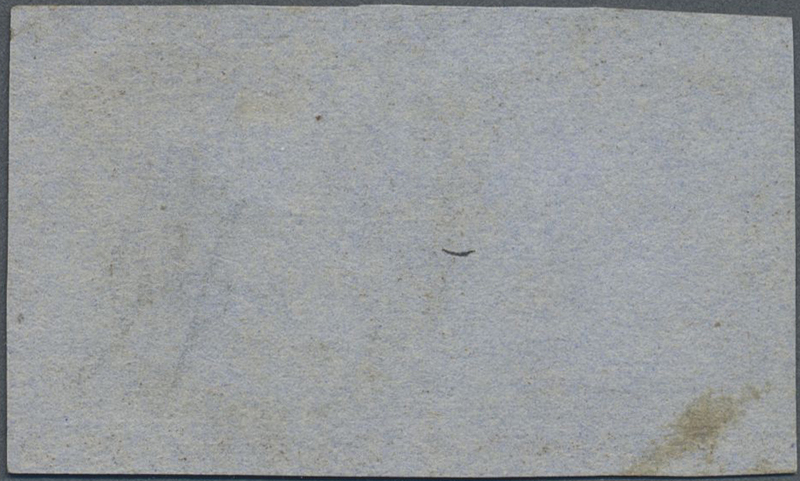 Slight creases but fine. 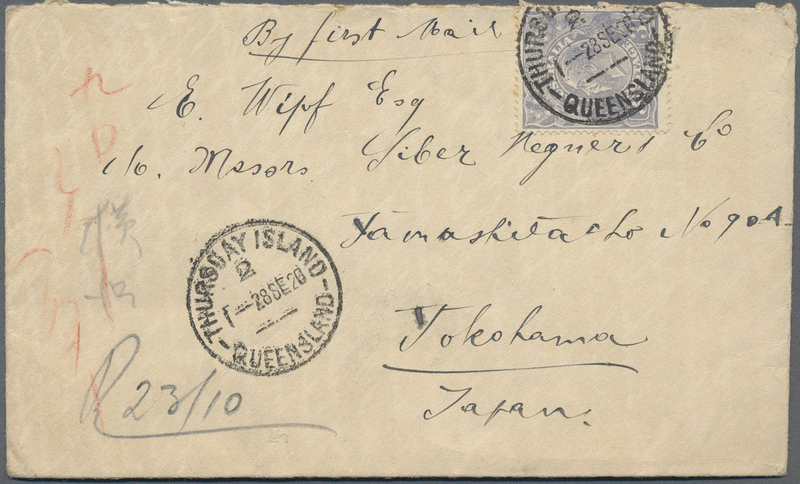 11332 Brief (cover) 1926/27: Three covers from a German visiting different countries, all sent to E. Wipf in Yokohama, with 1) 1926 (Sep) cover from THURSDAY ISLAND (a small island between the northern tip of Queensland and Papua-New Guinea) franked by Australia KGV. 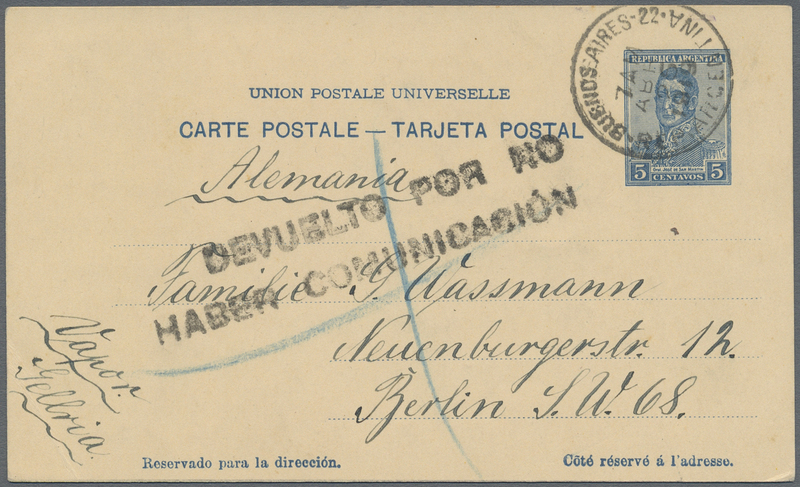 3d., 2) 1927 (Jan) letter card 1d. 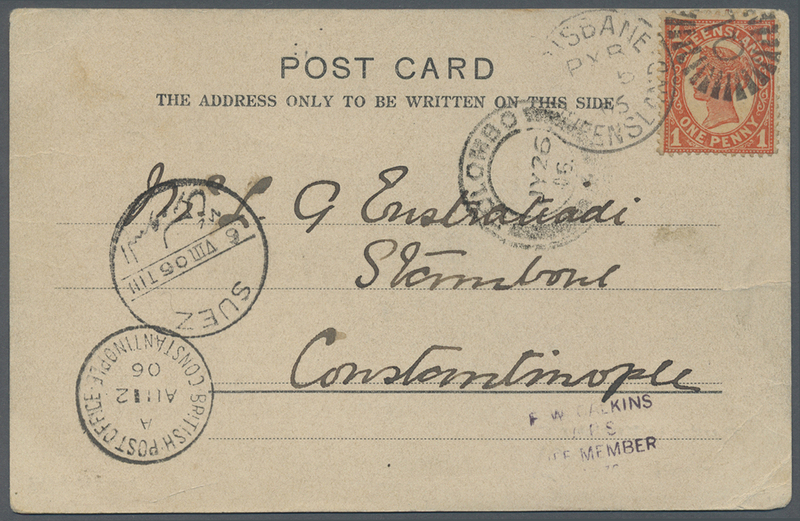 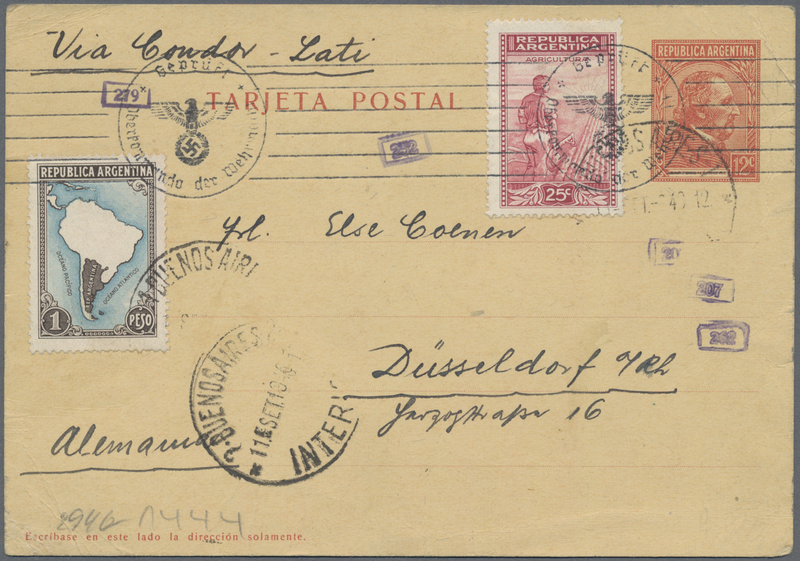 from Capetown uprated 2d., and 3) 1927 (Feb) cover from Livingston, Northern Rhodesia franked 3d., with traces of usage/ageing but still good to fine.